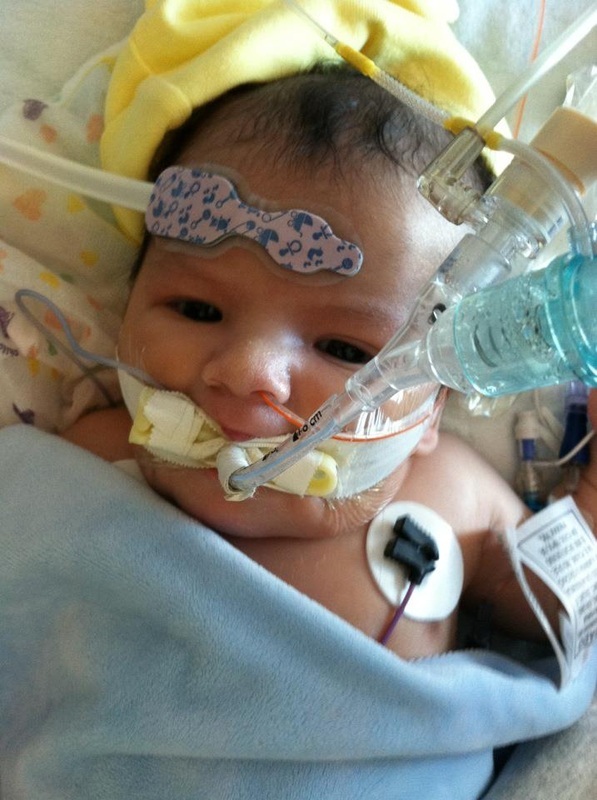 Asher James DeBouver was diagnosed wth Congenital Heart Disease & had his first surgery in the womb! He was winning his fight against CHD when blood clots developed & took his life. During his fight Asher's mom shared pictures online & inadvertently started "TEAM ASHER" that went viral & caught the attention of CBS 2 Chicago sparking several news stories. Through Asher we've learned that blood clots are common in infants & children, but that prevention & treatment are severely lacking. Currently we apply adult treatments to infants/children. This is ineffective! Infants & Children are not simply "mini adults" & they do not respond the same to the few treatments that exist. 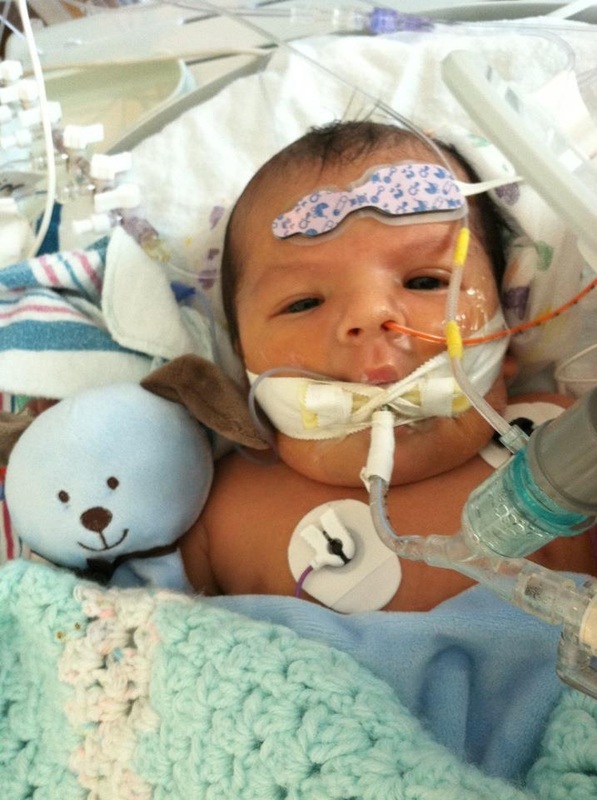 Asher's parents began a foundation along with leading physicians at Lurie Children's Hospital Chicago to bring awareness to this issue (and ultimately to fund research to solve this problem). They've been having great success, including speaking to both the House & Senate in March 2014! The story you will read below began as a letter to my amazing nephew Asher James DeBouver on the night he was born. It is a compilation of updates, photos, & videos that were written each day to update friends & family on Asher's condition. There are no words I could put together to capture these moments entirely; moments of joy and gratefulness combined with fear and disbelief. One second thinking about you being a teenager or going to college and the next watching your parents make decisions to keep your heart going during these first few hours of your life. We are filled with this amazing amount of joy because of what you mean to your mama and daddy (and to your family). And at the same time, we are terrified of losing something so precious. There are no higher stakes than these moments, right now, with you at Lurie Children's Hospital working hard to heal that perfect little heart of yours. We know you have these defects in your heart that are very serious, but you are, at the same time, absolutely whole and perfect. You are amazing. You are strong and steady. You are the opposite of everything going on around you. The world around you is an uncertain roller coaster and is constantly changing. There is noise and commotion and beeping and testing and opinions and procedures and medications and voices and doors opening and elevators dinging and other babies crying and more interventions and surgeries--and in the middle of all of this hurrying and fear and chaos there is you, There is you and your amazing heart that keeps right on beating, just as it should, steady and strong. Your mama is well known for being determined. When she knows what she wants & what needs to be done, it is done. By the time she's telling you about an idea, she already has it planned and in progress. You, little boy, are the only one who has given your mama a run for her money in that area. You have already had plans of your own much different than hers and you are the only one that I've ever seen make your mama say, "Well, it's not up to me." She would tell the wind not to blow (and I think it might listen) if she needed it to be a calm day. But you, little spirited boy, have her determination and stubbornness. During this time while you are fighting for your life these are beautiful qualities that we are grateful for. This determination that is as much a part of you as your eye or hair color is helping you to beat the odds. Your daddy started a new job with the Department of Defense so he asked for my help with taking your mama to some of her/your doctor's appointments in Chicago at Prentice Women's Hospital & Lurie Children's Hospital. (This was great news for your mama because for as nosy and talkative as your auntie can be, she also gets your mama cupcakes on appointment days.) During one of these appointments, Auntie and Mama came downtown at 8am (on Friday, September 7, 2012) and it was a long day. During the first appointment of the day Mama's blood pressure was unusually high and the doctors were concerned. 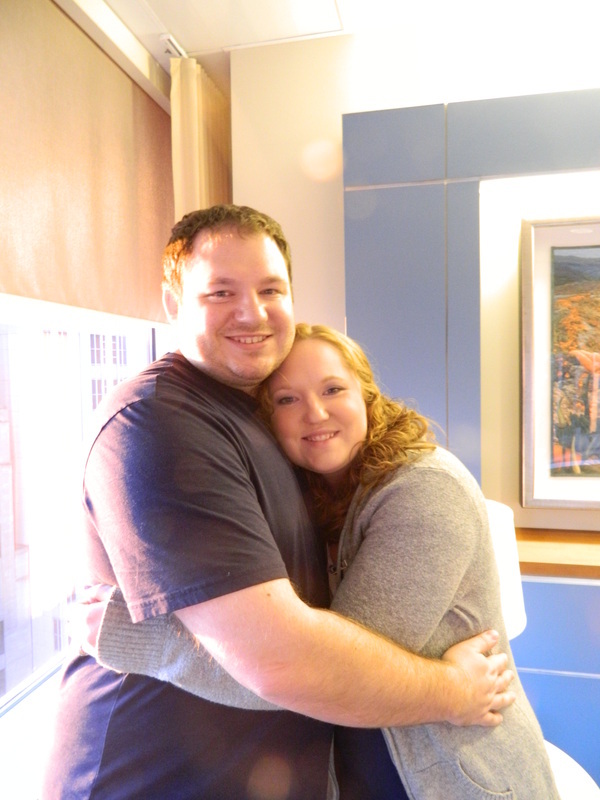 We thought it was because these appointments can be very stressful, but that blood pressure just wouldn't go down. Auntie and Mama went to the rest of her appointments and then went, as the doctors said, to a special triage area to monitor Mama more closely. Mama almost wanted to skip this--always saying she'd be fine and that it was no big deal, but she was always extra careful to do everything she could to take the best care of you, so even though she didn't want to go, she checked in to be monitored. 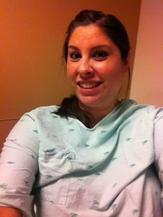 We thought they would just take a few blood pressures, but they had Mama change into a gown and started monitors and did blood work and urine testing. This was beginning to feel serious. We waited and waited and with just Auntie and Mama in the room there was no one to supervise Auntie so she pushed the blood pressure taking button a few extra times--well maybe more than a few extra times. Auntie was very concerned about Mama and wanted to know more often than the doctors did where Mama's blood pressure was at. What Auntie didn't realize (until the doctor grinned & mentioned it later) was that all those nurses & doctors out at the monitoring station saw all those extra blood pressure readings every time Auntie pushed that button. (And your poor mama's arm was a little sore after all that squeezing!) That darn blood pressure just wouldn't go down and when the doctor came in and told your mama they weren't letting her leave and that she would be admitted to Prentice Women's Hospital for the night she said, "Oh no I'm not. I have a movie to go to with my husband tomorrow." The doctor told her that she wouldn't be going to a movie--that she would be having a baby this weekend instead. Now your mama likes to plan things and she had just started packing her hospital bag the night before. But you, little guy, have your own way and time of doing things and Mama and all the rest of us are just along for the ride. Mama and Auntie started calling Daddy and Uncle Jeremy and making arrangements to have your brothers Socks and Boots go for a sleepover with their cousins Maddie and Baxter and to get the things Mama would need down to the city. 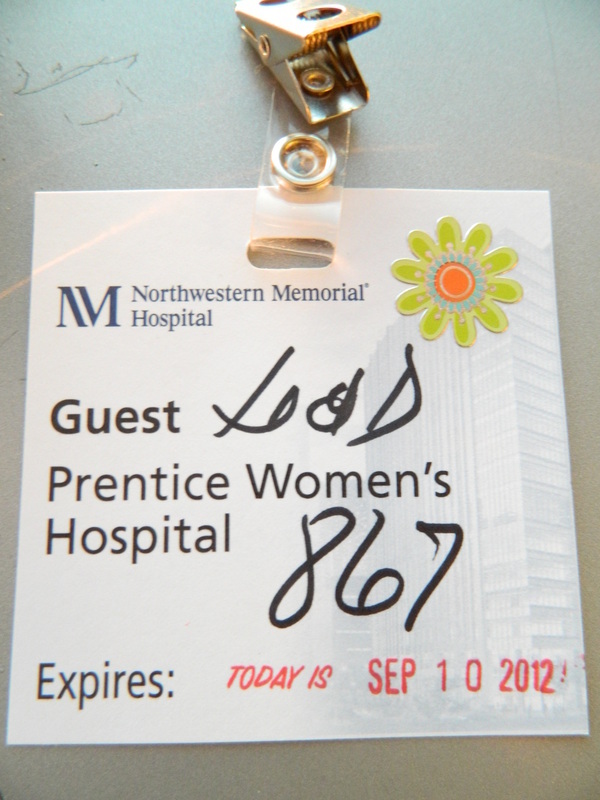 Auntie stayed with Mama and Daddy left work, got Mama's things and a few things for himself and came down to Prentice Women's Hospital in the heart of downtown Chicago. The doctors all thought Mama had Pre-eclampsia, but Daddy said the entire time that he knows Mama & that these hospitals and downtown doctors stress her out. There was a lot of testing all night Friday and when Auntie went home to take care of the dog pack (Socks, Boots, Maddie, & Baxter) at 1:30 am we still weren't sure when you would need to be born. If Mama's blood pressure got too high the doctors were concerned that it would limit how well her placenta would work and the placenta was what was helping your heart work. On Saturday Auntie had to watch the dog pack while Uncle Jeremy went to work at the Schaumburg Fire Department. Uncle Jeremy is a firefighter and paramedic and when you are big enough we will take you to ride on the fire trucks! Auntie was a little stir-crazy not being able to get back to the city to help Mama and Daddy. On Sunday, when Uncle Jeremy got home from work (and he could take over watching the dog pack), Auntie packed up her pickup truck with things she might need to stay for a few days and some things Mama and Daddy needed from home and headed back to the hospital. By dinnertime that night (Sunday, September 9th, 2012) we knew mama didn't have Pre-ecamplsia and that daddy had been right, but by that time Mama started showing signs that she was going into labor. The doctors thought it was best to induce labor at 3:30 am the next morning (Monday, September 10th, 2012) because there were teams of special doctors and nurses that needed to be there to take care of you when you were born. Auntie went home on Sunday night at about 11:30 pm and she picked up Grandma Susan on her way from Schaumburg to Chicago the next morning at 5 am. Auntie and Grandma Susan arrived at the hospital and your daddy showed us to the family waiting lounge. At 2:00 pm the doctors said it was time for Mama to start pushing. 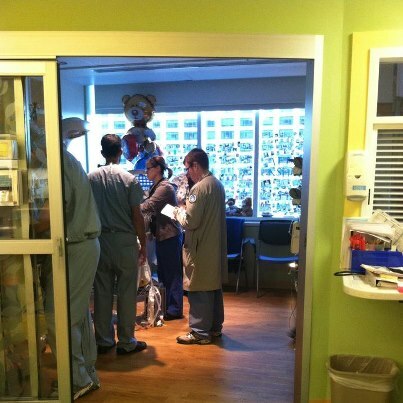 They got the team of doctors and nurses in the room waiting for you. Auntie, Grandma Susan and Grandpa Mihecoby went in the family waiting room which was right next door to your room. Grandpa was much more calm (and a lot less nosy) than Grandma and Auntie were. Grandma and Auntie kept thinking of excuses to walk past your room (we needed a drink, had to wash our hands, needed to go the bathroom) and at one point Grandma and Auntie just couldn't help themselves and they both put their ears right up to your door to see if they could hear anything. Auntie heard, "One more push Jennifer! 1-2-3-4-5-6-7-8-9-10!" and we got very excited, but then we heard an "ah hem" behind us. We sprung up because we had been caught! Dr. Peaceman (who delivered you) had left the room for a minute and he was on his way back. Dr. Peaceman chuckled at your Grandma and Auntie's antics. We quickly laughed and went right back into the family lounge with our tails between our legs. At that point we thought we better behave ourselves and find something to occupy our attention so that we didn't embarrass Mama & Daddy again! Grandma Susan set her laptop computer up so that we could watch funny episodes of Celebrity Jeopardy from Saturday Night Live. We were so anxious for you to be here and we were just waiting for that moment when we heard that you had taken your first breath and that you were stable and your heart was working on its own. We were so anxious that every second of waiting felt like a year. Your daddy loves Will Ferrell (& so does your auntie). So in honor of your daddy (who we can already tell you look JUST like) we watched some funny Will Ferrell videos to laugh a little bit in the middle of what was such a critical time. We needed to let those doctors and your parents do their job. We watched a few videos when your Grandpa Mihecoby noticed some commotion and Grandma got a text message that was a beautiful picture of you from your daddy that said, "Asher James 5:22pm!" You were here! The doctors worked with you and inserted two IVs and a breathing tube to help you and to give you medicine to keep your heart pathways open. Your daddy got to see you and touch your precious little hands and feet and then they wheeled you over to your mama so she could touch your perfect little hand. You grabbed Mama's finger & she had the biggest smile on her face. Mama began to cry happy tears, happy that her beautiful baby boy was here and was, at this moment, safe. The nurses were all smiling at how happy Mama and Daddy were. Daddy took a picture of this. 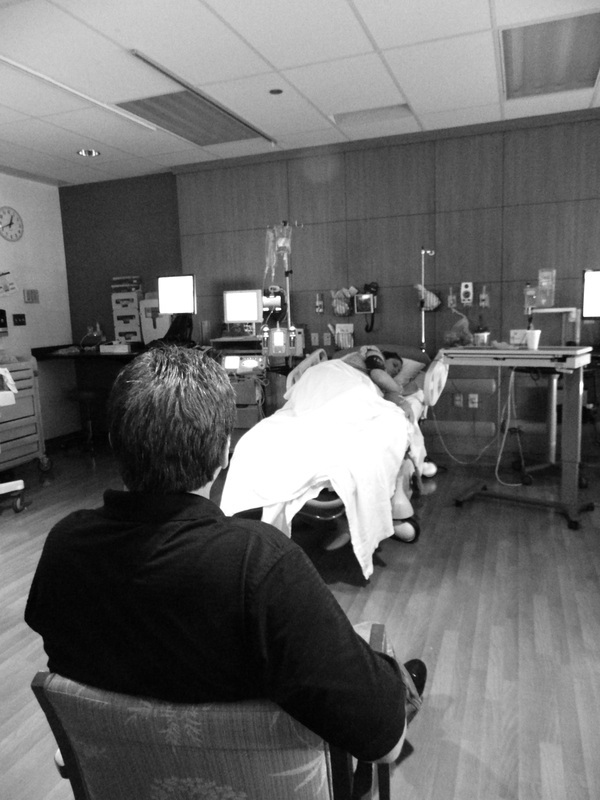 The doctors had to take you to the 10th floor (Mama delivered on the 9th) to stabilize and evaluate you further so they whisked you out of the room, but as you traveled by Grandpa, Grandma, and Auntie caught a little glimpse of you in your carrier. Auntie, being the nosy auntie she is, followed the doctors and nurses and you all the way down the hall and around the corner until they put you in the elevator. She blew you kisses and said we love you and told you to fight hard. 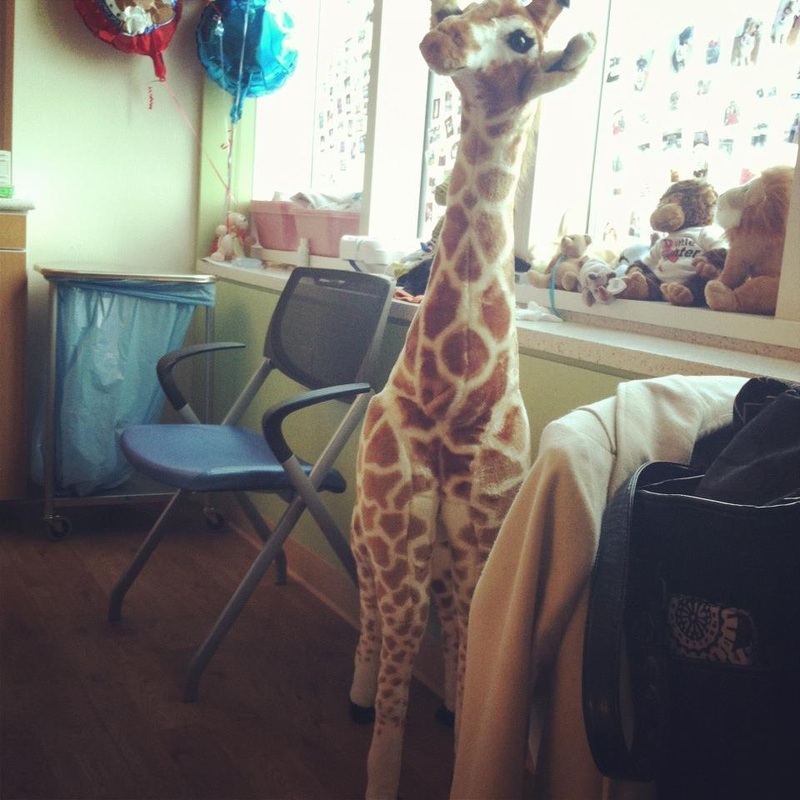 The nurses and doctors were all smiling, amazed at how strong you were and how well you were doing. 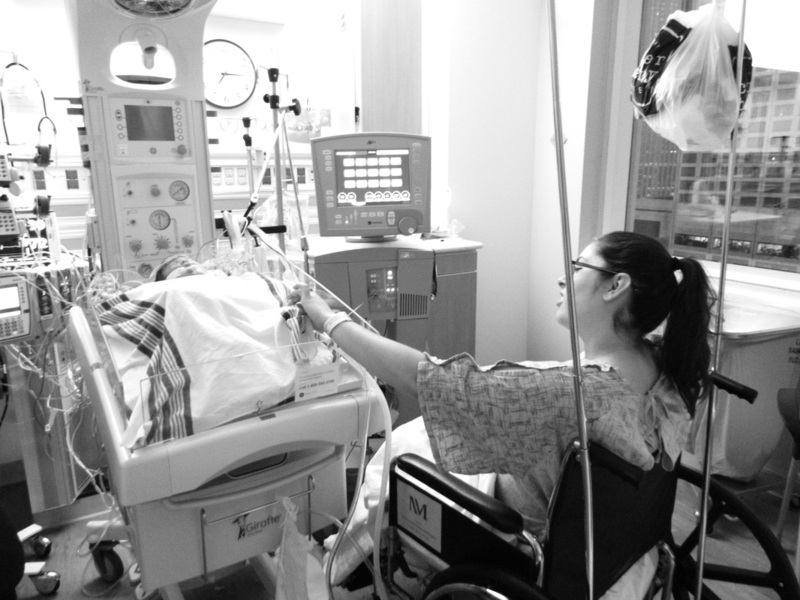 One nurse was cooing at you and another said, "He's doing so great!" as they rolled you into the elevator. During this time we gave Mama her privacy so they could get her put back together. Mama had just been in labor for 15 hours and had just pushed for 2 and a half hours straight with contractions every minute! She was exhausted and at the end you just didn't want to come out (and you were a big baby! 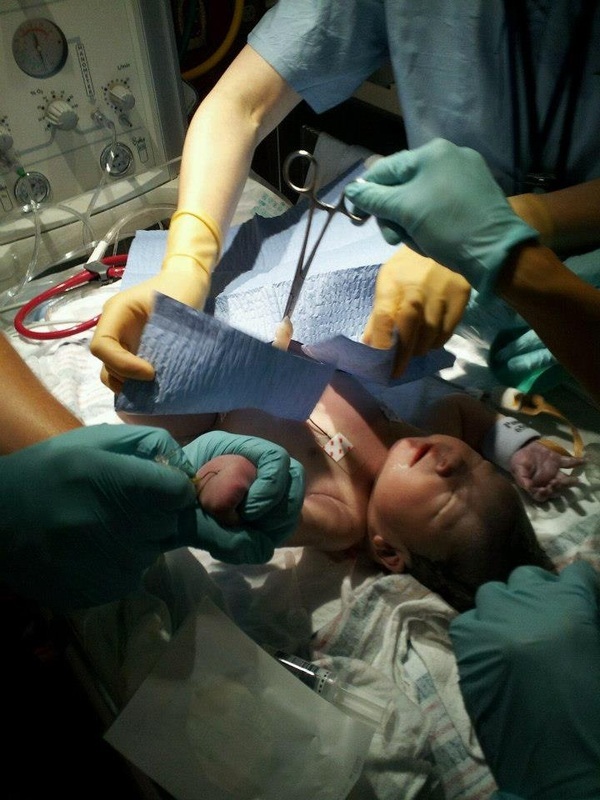 9lbs 1oz & 21 1/4 inches) so they had to use forceps to help deliver you. All that trauma was hard on Mama's body and she had a lot of external and internal injuries. They had to take Mama to the OR (operating room) to stitch her up and stop all the extra bleeding. Mama was in a lot of pain and we were worried about her. Your mama is an army woman & is very tough when it comes to pain. She just doesn't show it & she can tolerate a lot. Poor Mama came back from the OR and we had a bit of a scare! We were so relieved at how stable you were and then all of a sudden all our attention turned to her. Mama's blood pressure dropped VERY low, very quickly. The nurses started scattering around and grabbing the doctor and everyone sprung into action. The nurses gave mama several medicines to help her & to bring her blood pressure back up. Mama had a hard time communicating what she needed so Auntie & Grandma did their best to take care of her. Auntie noticed Mama was moving her hand and Auntie knew she must need something. We asked Mama questions to figure out what she needed and she nodded the answers. Mama was in a lot of pain and she was very cold. Grandma told the nurses about Mama' s pain and Auntie put socks on Mama's feet and got blankets out of the warmer, wrapping Mama up. Grandma rubbed Mama's forehead and Daddy held Mama's hand while at the same time communicating with the doctors on his cell phone about you. Auntie rubbed Mama's legs to keep her warm and counted down the time aloud until the anesthesiologist & nurses came to give mama pain medications so mama knew what was going on . We all told her what an amazing job she did taking such good care of you and giving birth to such a beautiful, strong boy. You could tell Mama was very concerned about you. After several types of pain medications, Mama's pain was low enough so that she could sleep and her blood pressure came back up to a normal range. Mama had been shaking because she was so cold and now she was nice and warm and resting. She only rested for a short time before she was in pain again. At this point Daddy had to go to be with you. While he was with you, you squeezed his finger! What a strong boy! Daddy told us that when you were just born you reached your chubby little hand out and grabbed the doctor's gown! Daddy laughed & the doctor (although he was very surprised) laughed too. Mama was again resting and after a couple tries (because she fainted again after trying to get from her hospital bed to a wheel chair to go to the recovery room) we did eventually get Mama onto another rolling bed and into a recovery room. Daddy got her situated and told her he loved her and then he came back and took Grandma & Grandpa to Lurie's Children's hospital with you while Auntie stayed with Mama. It was about 11pm by this time. Auntie went back & forth and got the nurses each time Mama's pain got too high. Mama was very uncomfortable from the trauma and injuries from your birth, but she was very strong. She stayed focused and barely made a noise. Auntie could tell from her facial expressions though that she was in a lot of pain and Auntie reported that to the nurses who worked to get mama comfortable enough to rest. Mama had a lot of aches & pains and her legs were so sore that she just couldn't get comfortable enough to sleep. Mama needed to sleep so she could go see you as soon as possible. Auntie microwaved wet washcloths in the lounge across the hall and brought the warm wash cloths back & forth to put on Mama's legs to give her some relief. Auntie helped Mama with her blankets & pillows and got her ice water and did her best to help take care of Mama. Mama was able to sleep for 25 minutes to an hour at a time. Auntie organized Mama's room and got her laptop and phone and snacks set up. Mama really wanted a ham & cheese sandwich (because pregnant women can't have lunch meat) so right before you were born Auntie & Grandma ran to Corner Bakery to get Mama that ham sandwich. We used ice to keep it cold and when Mama was ready to eat at 3am, Auntie had that sandwich ready! Mama ate her ham sandwich and went back to sleep. Auntie was getting pretty sleepy at this point, but she had a job to do! She was updating your daddy on how your mama was doing & was getting updates from your daddy about you to give to your mama. You had to be put on a respirator and have a procedure where they used a needle to release some air that had gotten in between your lungs & chest wall. Then later you had to have 2 parts of a heart surgery. The first one opened a pathway between the left & right side of your heart & the second one reopened the valve they opened in Houston when you were still in your mama's tummy. We were all very nervous every step of the way, but you did amazing through each twist and turn. You stayed so strong! Your heart beat stayed regular and strong through everything. Auntie fell asleep for a few minutes while she was looking out the window from the fold out couch in Mama's room. 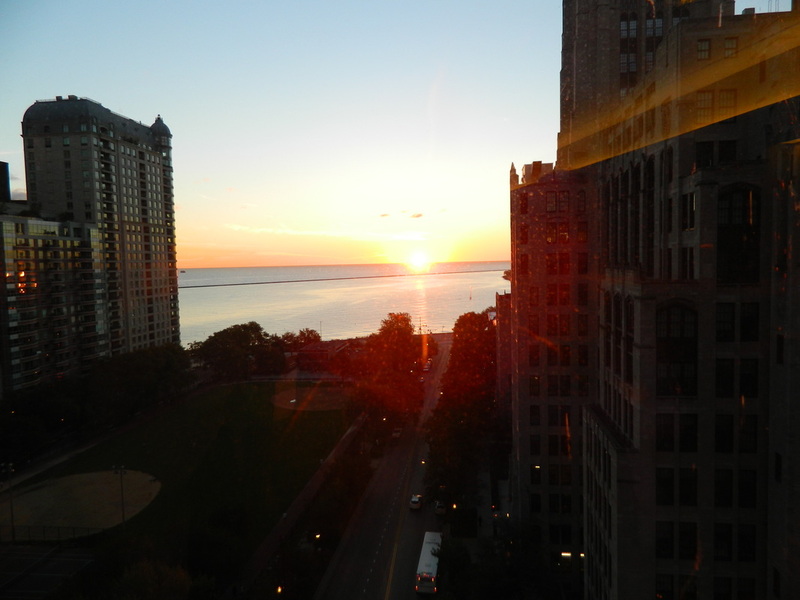 Mama's room had a Lake Michigan view & it was quiet and still and Auntie could see the moon shining on the lake. She thought to herself, "How lucky we are." "Right now our sweet Asher is fighting hard and he has this scary and difficult path, but he is strong and he is safe and he is here with us and right now that is everything." "Mama is safe and Daddy is safe and so many people that Auntie loves so much are safe." As you continued to fight, your mama also had a fight of her own. The next morning Mama's legs weren't functioning. She couldn't stand or put weight on them at all. Mama tried to stand with Auntie's help and she collapsed onto the floor. Your mama was so determined to see you though that her & Auntie got Mama in and out of a wheel chair & cleaned up and prepared to see you even though your mama's legs still wouldn't hold weight. We all thought Mama's legs would be fine with just a little more rest, but things weren't working out that way. Your mama was so determined to see you though that with the help of her dad, your Grandpa Mihecoby, your mama got into a wheelchair and all the way over to Lurie's to spend some time with you. Your mama was so happy to see her baby boy! Your daddy was happy to have the people he loves so much together. The doctors & specialists & physical therapists came to see your mama and they determined that the long labor had temporarily damaged Mama's legs making them weak and unable to support her weight. Each day your mama's legs got a little bit better, but when she was discharged from the hospital she needed leg braces, a walker, & a wheel chair to get around. She was willing to use all of those things and to do whatever it took to be near her baby boy. Your mama & daddy got a room on the 12th floor (3 floors under you) at Lurie's Children's hospital. 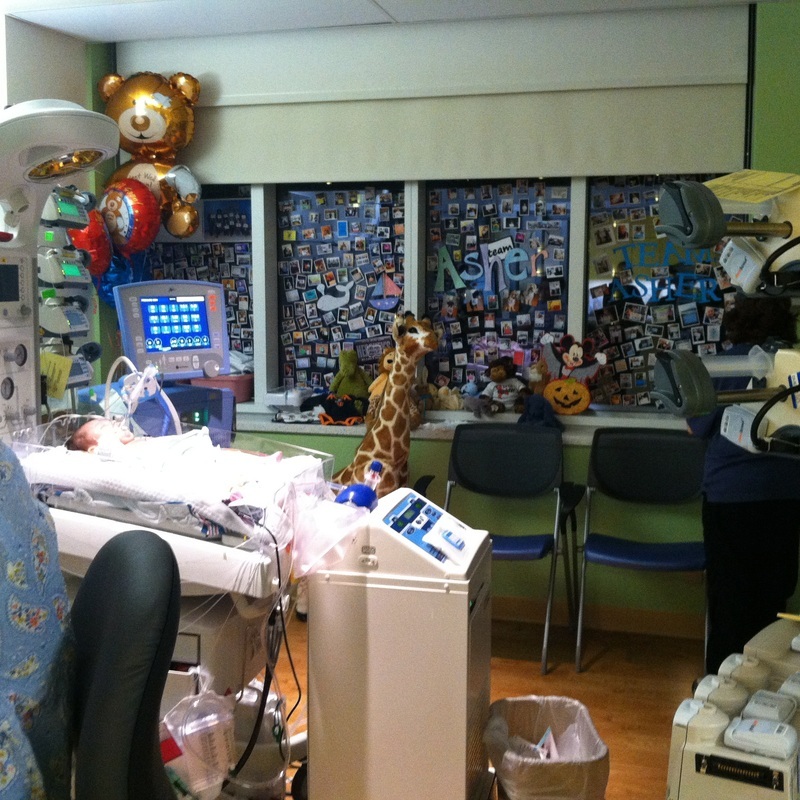 The hospital along with Ronald McDonald House has a few rooms available for the parents of the most critically ill children. "I'm sorry mom was here so late today. 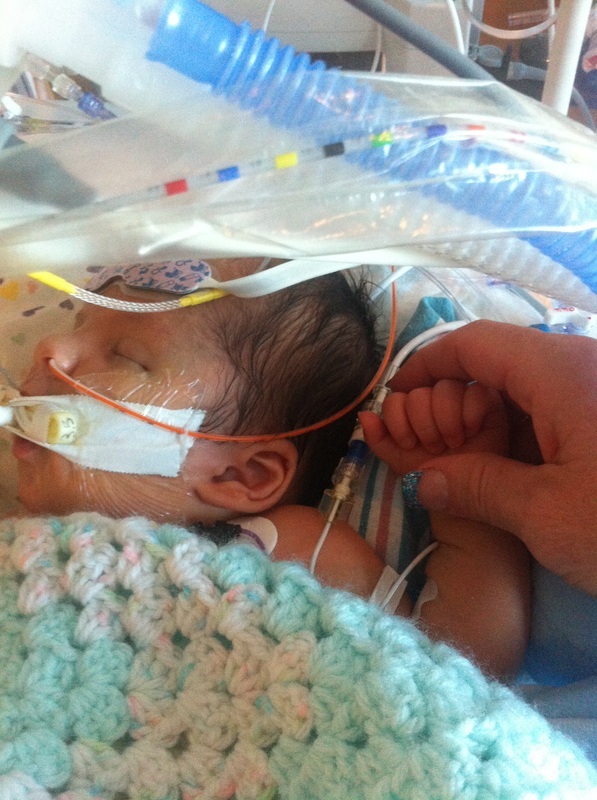 There is a lot to do to help take care of Jen & Asher. They are in two different hospitals connected by a bridge and they have all of us plus a team of doctors and nurses. We all love Asher this much & I hope you know that that is how much we love you too. You have been a gift every minute of your lives and there isn't anything we wouldn't do for you. I love you with all my heart & can't wait to give you a big hug. Always remember how precious you are!" Your Auntie Emily responded back with "Don't be sorry! You guys are there to support the people we love and that's all that matters. We're praying for everyone and we love you guys so much. We're too blessed to have all of you in our lives." Auntie Audrey said, "I'll do everything I can to help. I love you all so much" And Uncle Larson is so excited that you're here and he can't wait to see you & play with you & teach you all sorts of things. You are already, baby boy, so precious to so many people and your presence in our lives makes us remember how lucky we all are to love and be loved. Asher James you have been a fighter all this time! So strong & so brave! You keep fighting little man. Your family is here with you every step of the way. We love you so much & are so happy to know you and have you in our lives. We are all going to hold onto each other and get through this one moment at a time and at some time, far in the future, we will look back and smile at how far you've come. You hold onto us our little Indian boy and we will hold onto you. Asher is doing great! He was taken off the paralytic so he will be moving soon. His chest tube was taken out. His pulse reading in his leg is good. They went in through his leg to put the balloon in his heart & that leg is healing & regaining blood flow. (It was purple, but now only his foot is purple.) 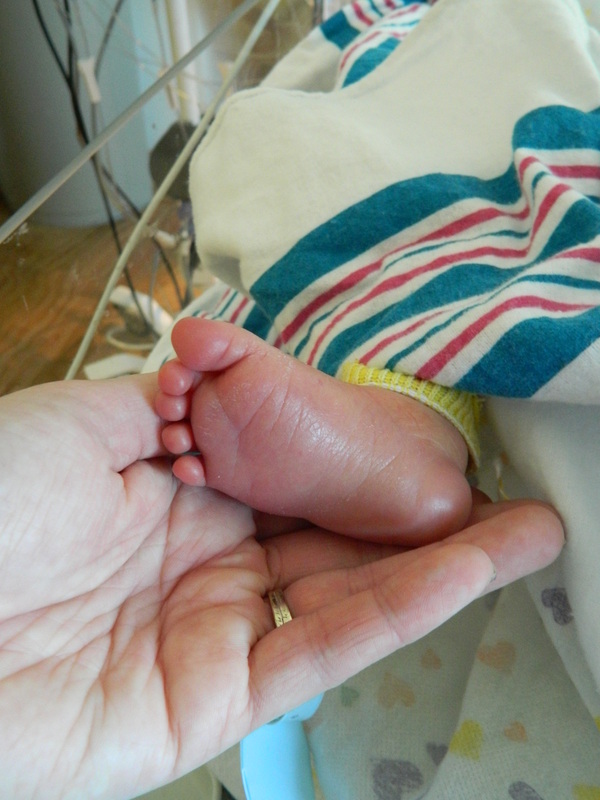 Asher wiggled his toes, grabbed onto mommy & daddy's fingers, & quivered his lips. We got mommy her own wheelchair & walker so we can check her out of Prentice tonight & move her to the sleep rooms a few floors below you. Asher is having an even better day today. He is moving his hands, squeezing his mommy & daddy's fingers, breathing more on his own (with some help from the respirator), & lifting his leg up. 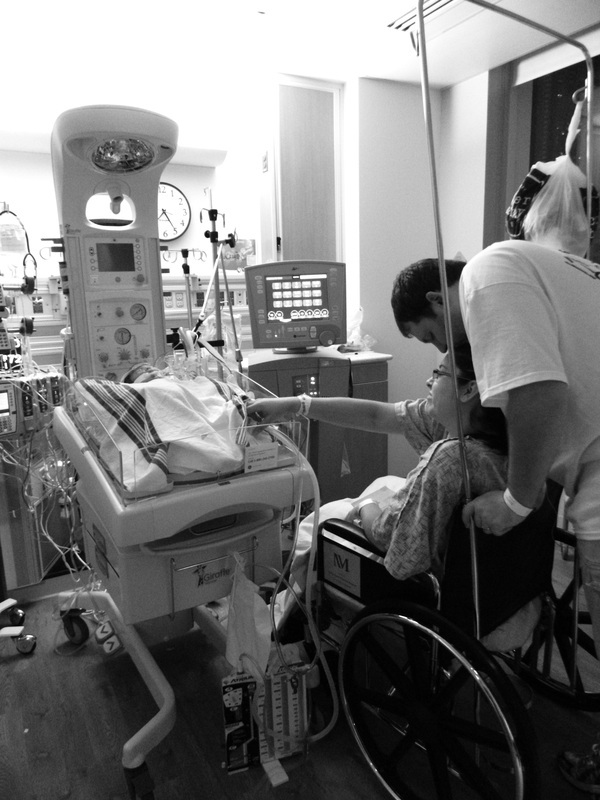 Daddy is helping Mommy, pushing her in the wheelchair to come see you as much as she can. 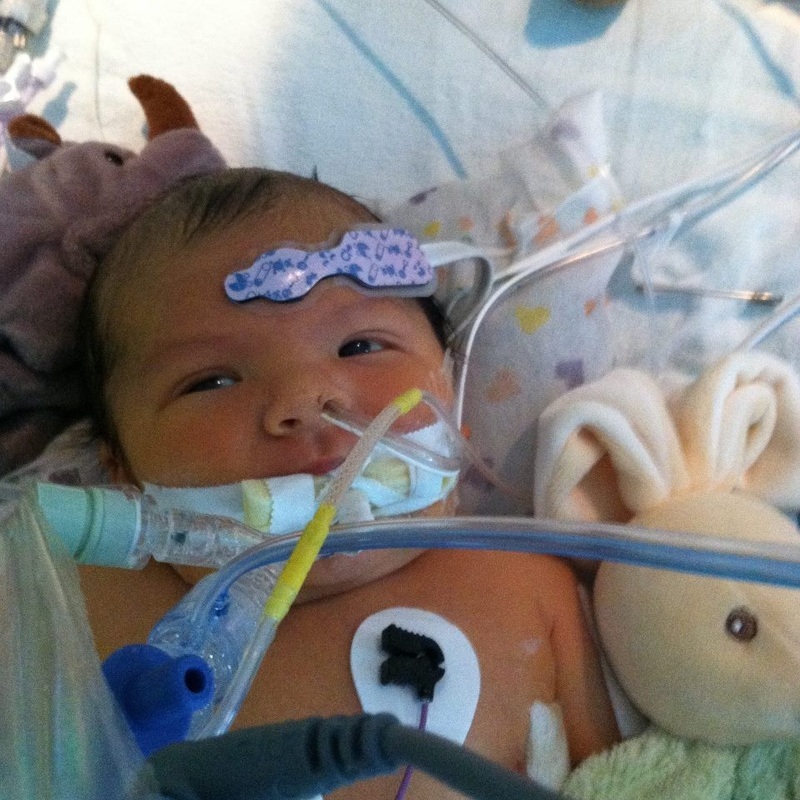 Asher's oxygen levels dropped last night, but he is doing better today. Mommy & Daddy love to spend time with Asher. Poor Mommy! When she was released from Prentice a few days ago & got an infection while she was there. They didn't give Mommy any discharge papers or instructions so Auntie & Mama had to take a trip, in her wheelchair, across city streets to the Northwestern ER so she could get treated. After 6 hours they gave her a prescription which Auntie went out to fil around 2am in between doing laundry (the laundry machines are always occupied during the day & we want to spend that time with you anyways!). We're very relieved to have medicine for Mama though so she can get better soon. 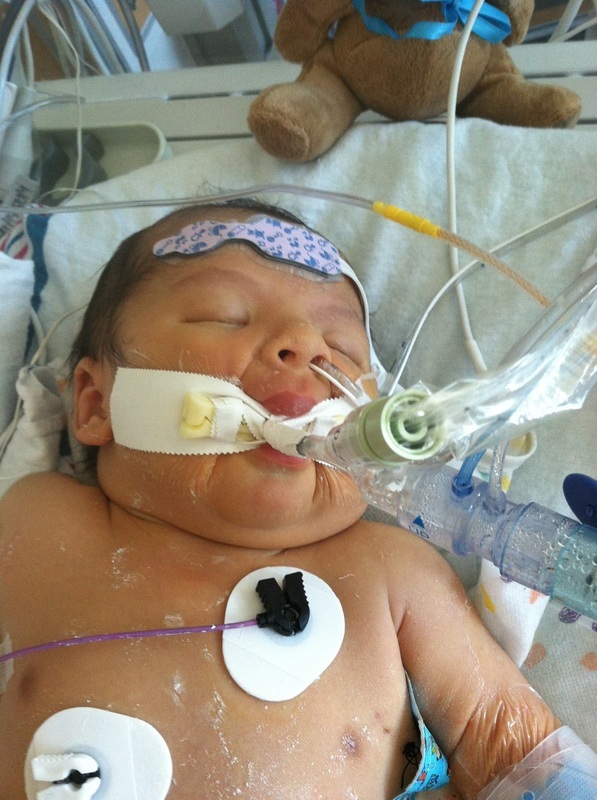 They continue to lower Asher's meds & lower the respirator settings. He is staying strong at every turn. 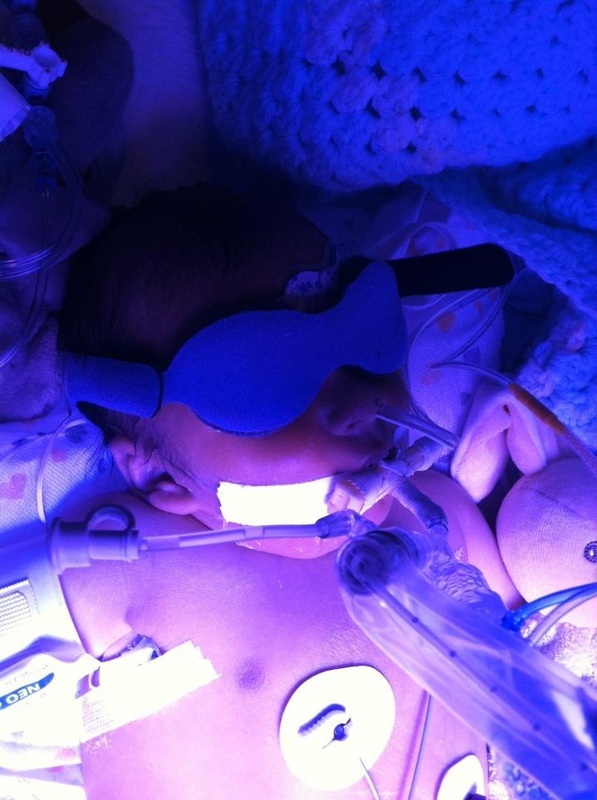 They put the lights on him because his bilirubin is high (Jaundice). Asher is moving more & he is opening his eyes! He loves to look at his mommy & daddy! 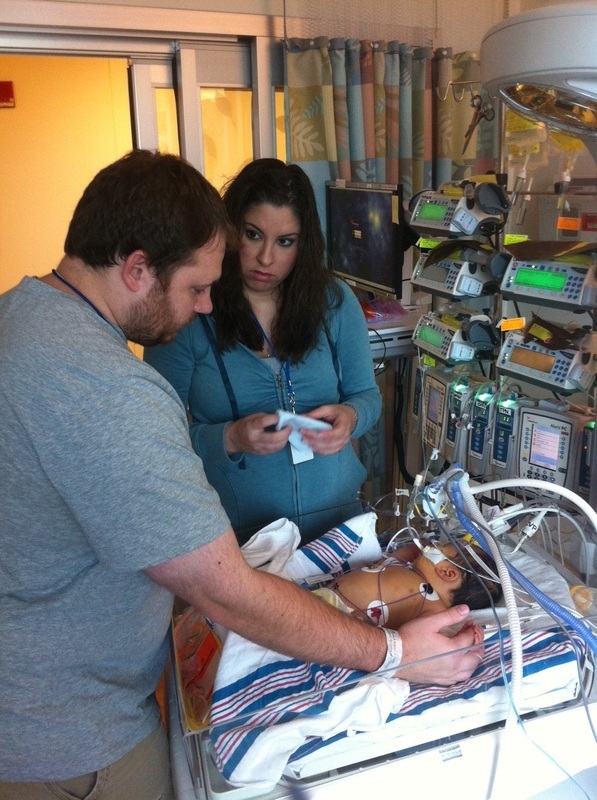 We got a lot of technical & complicated updates about Asher's heart today. The information was very overwhelming. 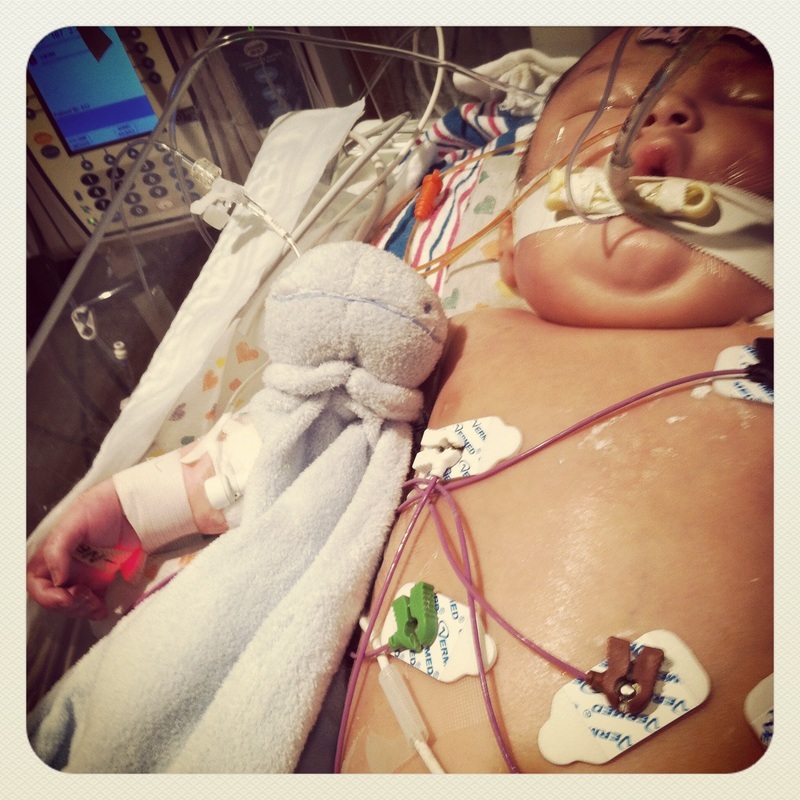 Asher needs a lot of repairs to different areas of his heart including the aortic arch. 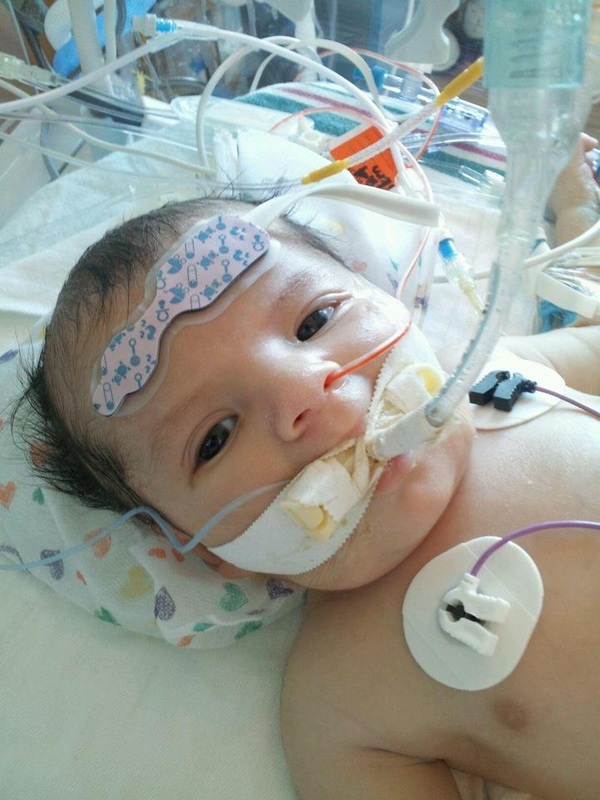 The doctors are working to come up with a plan to figure out which repairs will be best for Asher's heart & which repairs will be too hard on his heart. They are doing more testing and we will hopefully have a more clear plan in place later this week. Auntie stays with Mommy as much as possible during the times when Daddy has to go to work. Uncle Jeremy is watching your doggies, Socks & Boots, at our house with our doggies Maddie & Baxter. They all can't wait until you come home! They can't wait to lick you & let you pull their tails & ears & climb all over them. Asher's mommy got to change his diaper today! Mommy & Asher wear their sunglasses. & she didn't use the wheelchair at all! She made it all the way to his room & back with the walker only! Uncle Jeremy finally got to come see Asher today! 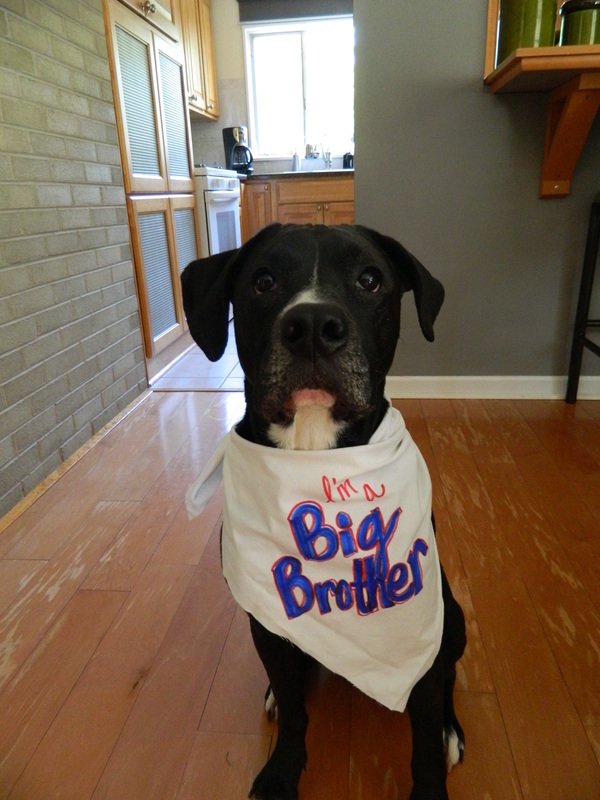 (He's been home on dog duty so Auntie could be at the hospital with Mommy & Daddy.) After meeting Asher, now Uncle Jeremy loves babies. Asher looked like a little WHO (Dr. Suess) baby today! 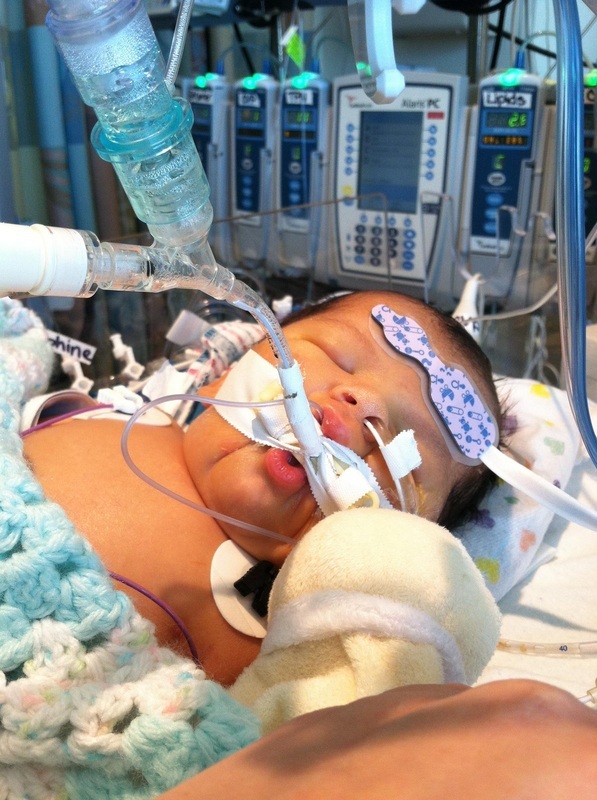 Asher had a blood transfusion to boost his red blood cells & oxygen levels. 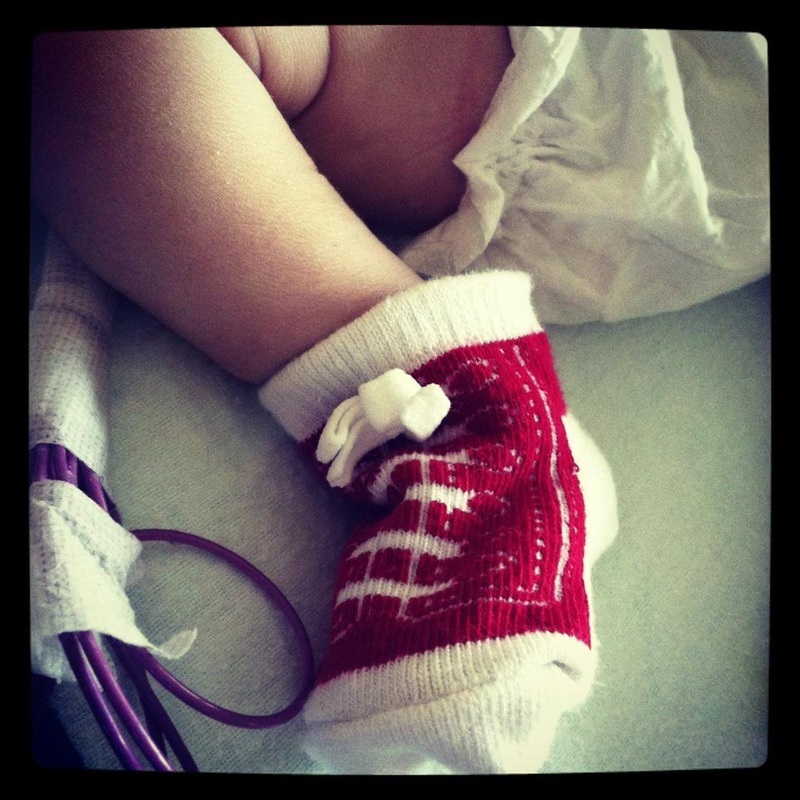 Asher's right foot began to turn purple again (restricted blood flow due to procedure after birth). Grandma Susan came for a visit & worked to get the blood flowing better through that little leg & purple foot. Asher was agitated often today & some of his stats & vitals were too low. Poor little peanut cried big tears (but could not make noise because of his respirator). By the end of the night they reupped some meds that made him more comfortable, helped him sleep better, & that kept him more stable. Asher's mom can walk on her own today! This is her first day without any assistive devices! We did learn that she cannot sit on the floor & expect to be able to get back up from that position yet. Mommy gets very tired still so while Auntie put new sheets on her bed she sat on the floor & got stuck! She couldn't get back up! Auntie & Mama worked together to life her up & back into bed. Then they laughed! A lot! The doctors will take Asher for an MRi this morning to get a better look at how much leakage/backflow of blood there is in his heart. This will be another piece of the puzzle that will help them determine which surgeries Asher will need. Surgery was going to happen on Friday, but will now wait until Tuesday. This is positive because it means Asher is stable enough to wait longer for the repairs his heart needs (and to wait to give doctors more time to make the best decision possible). Asher has gotten rid of some of the fluid in his body (which is good), but his breathing tube was too small and there was leakage so the old tube was removed & a new one was put in. Asher's foot has gone back & forth between being various shades of purple (and has looked normal at times). 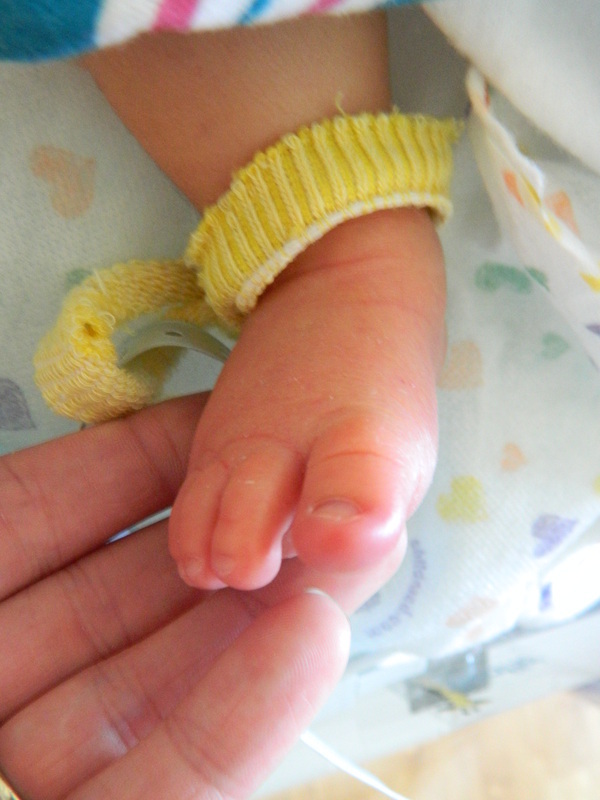 There is a lack of blood flow that causes the purple foot from complications from a surgery he had right after birth. Auntie is rubbing Asher's foot to stimulate blood flow & keep it warm. Asher has had a fever & antibiotics have been started for a bacterial infection. His fever has gone down & he seems to be more comfortable than he was. A decision will be made soon about what course of action will be taken to fix Asher's heart--more surgeries or a heart transplant. We are all waiting anxiously at the hospital for this decision. While we wait we are loving spending time with Asher. He is such a joy! The doctor's have decided to repair Asher's Aortic Arch (& not to go with a heart transplant right now). They think that repairing his aortic arch will allow him to go home & will allow his heart time to grow stronger so that in a few years he can have the repairs to his valves done. Asher was taken in for surgery at 12:30pm & we were able to see him at 7:00pm. We were updated every hour on his progress & every update was positive. The surgeon said the surgery went better than they had anticipated. It will take time to evaluate the effectiveness of this surgery, but we are very hopeful. 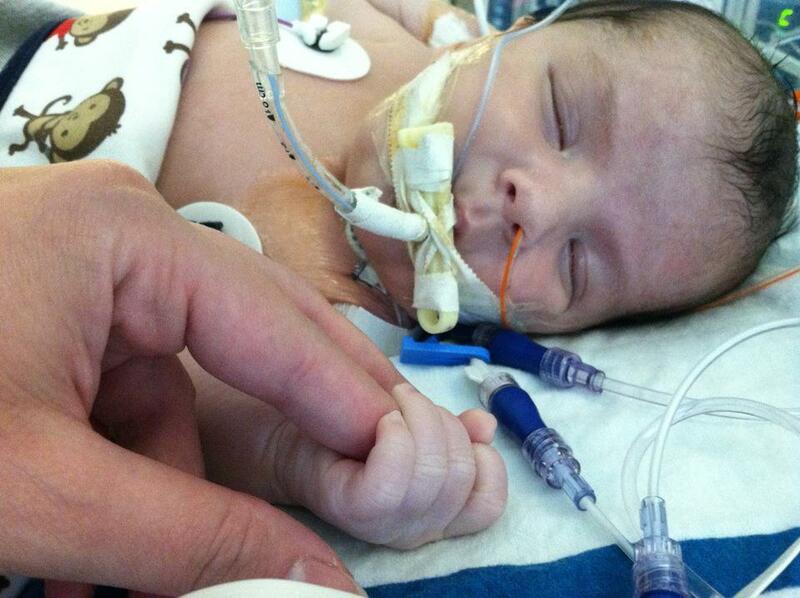 There is a possibility now that Asher may be able to go home in approximately 2-4 weeks. Auntie & Grandma Susan waited with Mommy & Daddy during Asher's surgery. Asher's mommy got him the Alligator for his 1 week birthday/his MRi. 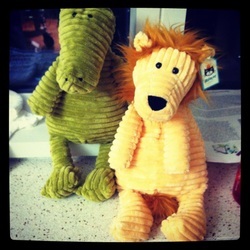 Auntie got Asher the lion for his big heart surgery. Today is Asher's daddy's 29th birthday. Asher is doing well after his surgery yesterday & is healing and resting. 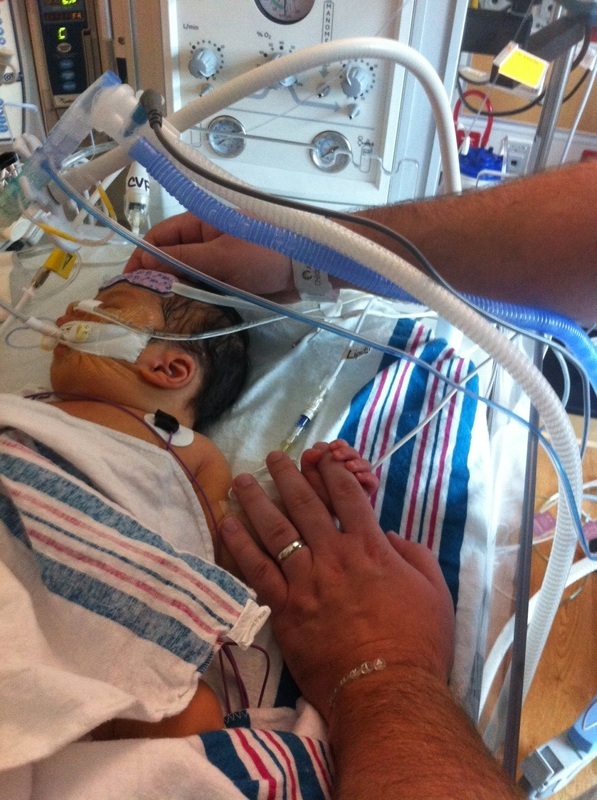 What a great birthday present for Daddy--to have his baby boy's heart surgery go so well! 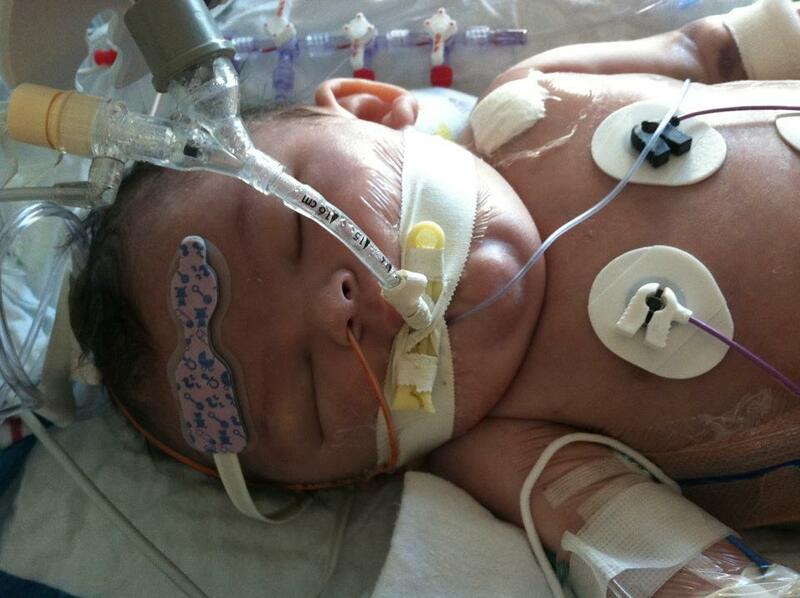 Asher is still on the paralytic & breathing tube. There is a possibility those things will be taken away tomorrow. They tried to stop the paralytic today, but Asher wasn't liking the breathing too so they restarted it. Asher was in some pain (probably from the incisions & clamping during surgery), but the nurses & doctors responded quickly & gave him more medication to make sure he was not in pain & could rest comfortably. Asher's Daddy is very thoughtful & he has been trying to find time to bring some items to help the other families who are staying in the Ronald McDonald House sleep rooms. So for his birthday, Auntie (along with Auntie Em) brought a big container full of helpful items (bottled water, garbage bags, laundry detergent, dryer sheets, paper towels, etc.) to donate to the community. Asher's daddy didn't want a big fuss made about his birthday this year so we chose to do something for others in his name. He liked this present so much that this might be a great annual tradition! Auntie really likes this idea for her birthday too! Asher has remained stable & they have taken him off the paralytic. We are waiting for him to begin moving & to see how he tolerates his breathing tube. If all goes well, they can keep him off the paralytic & can hopefully remove his breathing tube this week. Asher's nurse Holly always makes sure Asher has his stuffed animals to cuddle with & today she "dressed" him super cute! 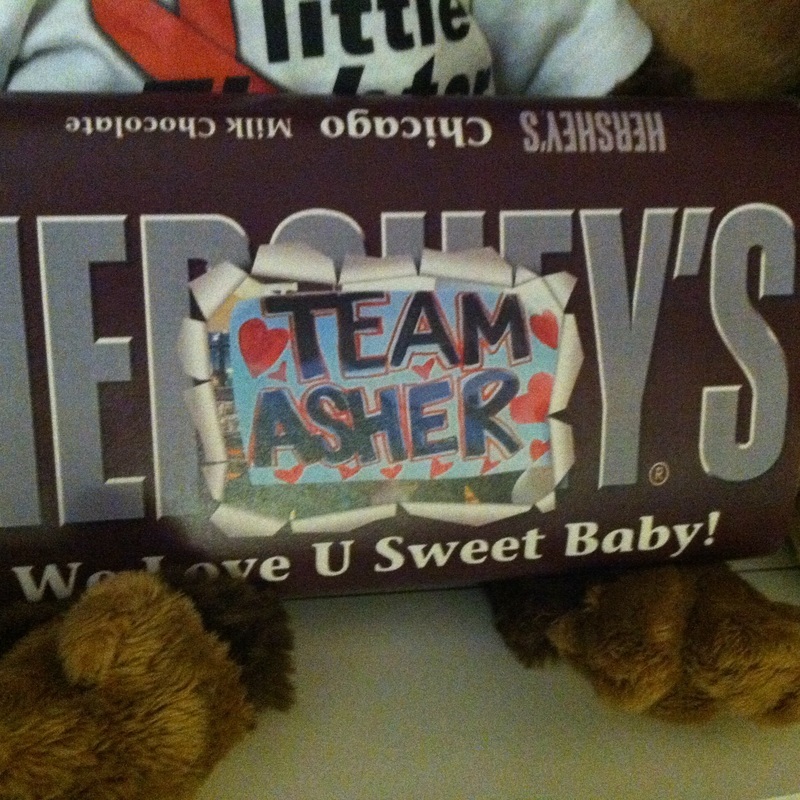 :) We love Asher's nurses! They are amazing! Asher is doing well & is becoming more alert & active. He is no longer on Dopamine & his Morphine has been decreased by half. His feeding tube was changed to a new type & he is getting breastmilk (mom has been pumping & freezing). Asher has a mobile that plays music that he can look at. Asher had a very good day today. He was wide awake, alert, & following the sound of Mama's voice for hours! When the nurses gave Asher a medicine that makes him sleepy he fought to stay awake & look up at his mama & his other visitors. Grandma & Auntie visited today. Asher had a tough night, but started doing better during the day. 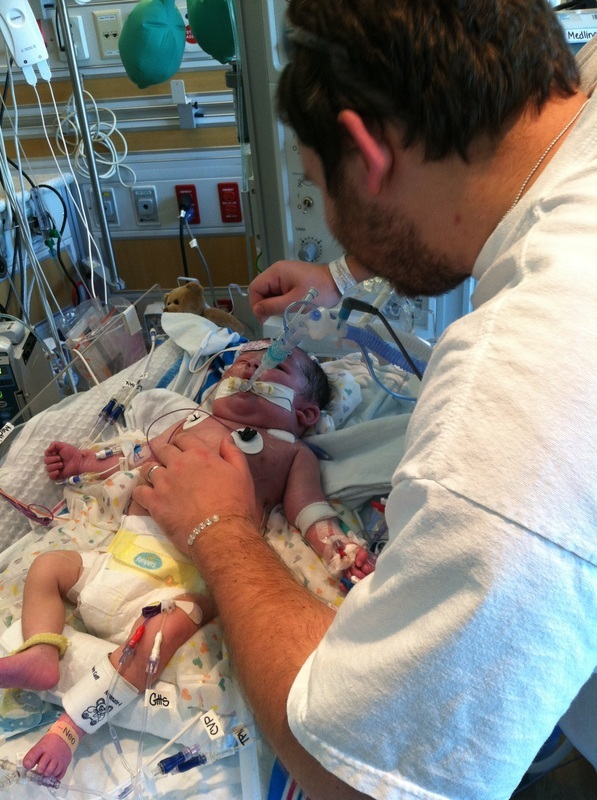 They tried to go down on the ventilator settings too soon so that they could remove the breathing tube, but Asher wasn't ready for that yet. They were able to remove Asher's chest tube which will help with his pain level & will help him breathe better on his own. Mama & Asher had a surprise visitor all the way from Oklahoma today! Grandpa Mihecoby! Asher is having a good day today. 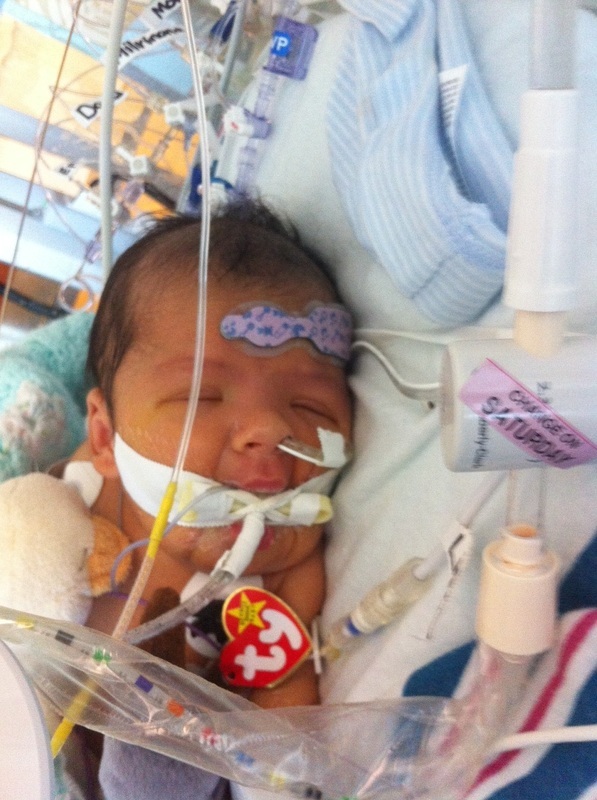 His ventilator settings continue to be lowered & he is tolerating that well. 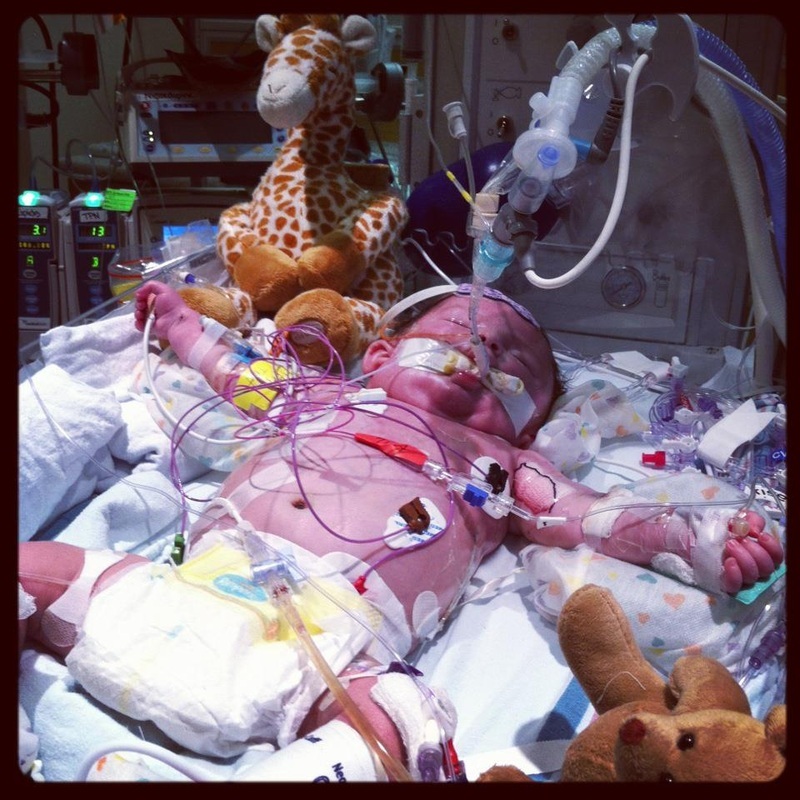 Lower settings mean Asher is getting closer to being able to have his breathing tube removed. He is having some trouble with the larger doses of milk so milk has been stopped for the day & will be given again in the evening. Asher had a difficult night. Most of Asher's nurses are wonderful, but last night he unfortunately had a nurse that wasn't very gentle with him and he was agitated and uncomfortable. When this happens he spends most of the next day sedated and therefore not making forward progress. We will ask that this nurse not be assigned to Asher in the future. He still isn't tolerating the larger doses of milk so tests will be run today to figure out why. The settings on the ventilator continue to be lowered and that is going well. 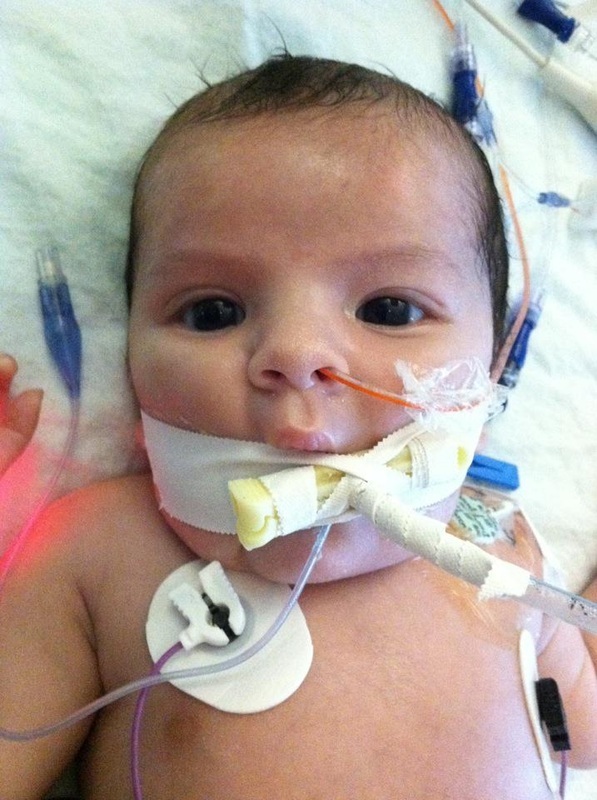 Asher's mouth tubes may come out sometime tomorrow if he continues to make good progress. 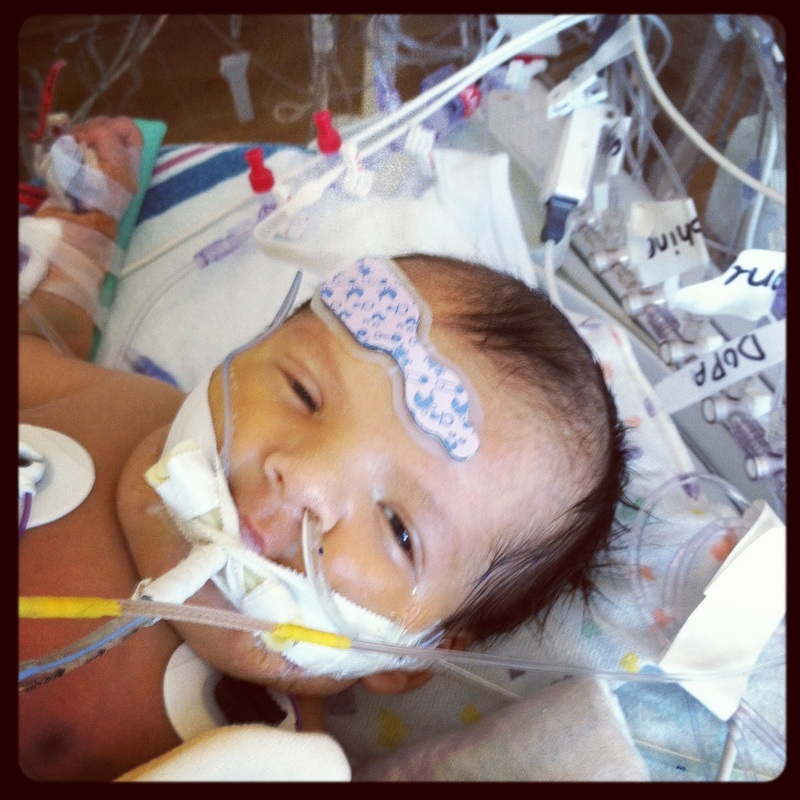 Asher is still doing well on the lower ventilator settings so his mouth tubes may come out today. Mom & Dad will have to move today from the sleep rooms on the 12th floor of the hospital (3 floors under Asher) to the Ronald McDonald house 1/2 miles away. It will be a difficult to be farther away from Asher and it will be more challenging for Mom to see Asher each day because she is still having trouble walking & with weakness in her legs. We all can't wait until Asher can come home! Asher is sicker today than he has been. They've put Asher in isolation (Mom & Dad can still visit him, but have to get "suited up" in masks, gowns, & gloves) because it seems like he has an infection. Asher was started on antibiotics & a variety of tests are being run to determine what is causing his setbacks. His left leg is limp & Asher isn't responding like he was before (he is staring off into space), so tests are also being done to determine the cause of this issue. 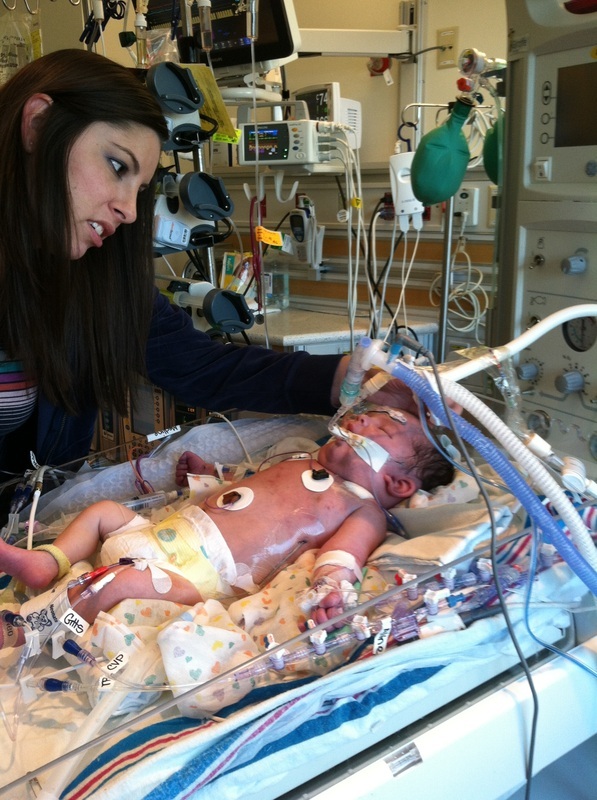 Removing Asher's breathing tube will have to wait due to these setbacks. Neurology will visit Asher & he will have an EEG today. 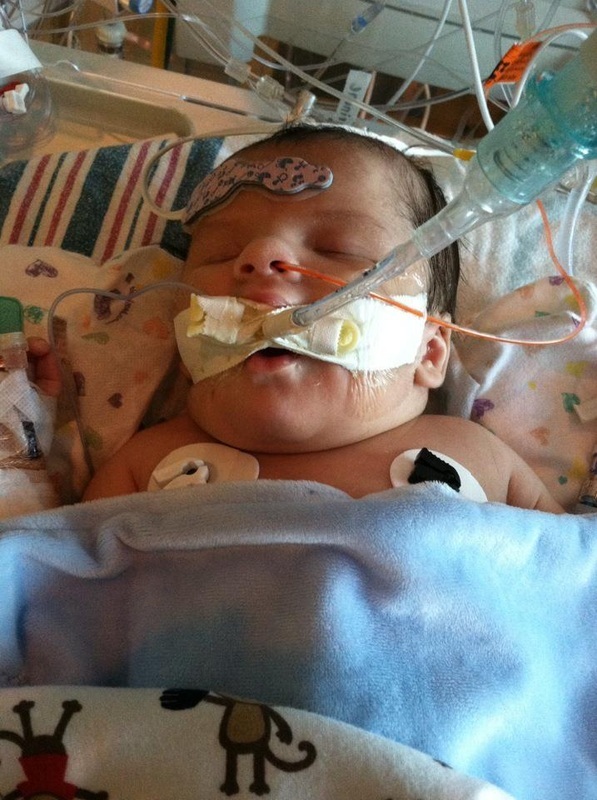 Asher's testing & monitoring showed no signs of stroke or seizure. He is still on antibiotics & Tylenol for his fever & the cause of the fever has not yet been determined. All of the labs & cultures have come back negative. Asher's condition is critical and he cannot have any visitors until the cause of these issues is figured out & he is stable again. Asher had an MRI today & a spinal tap. 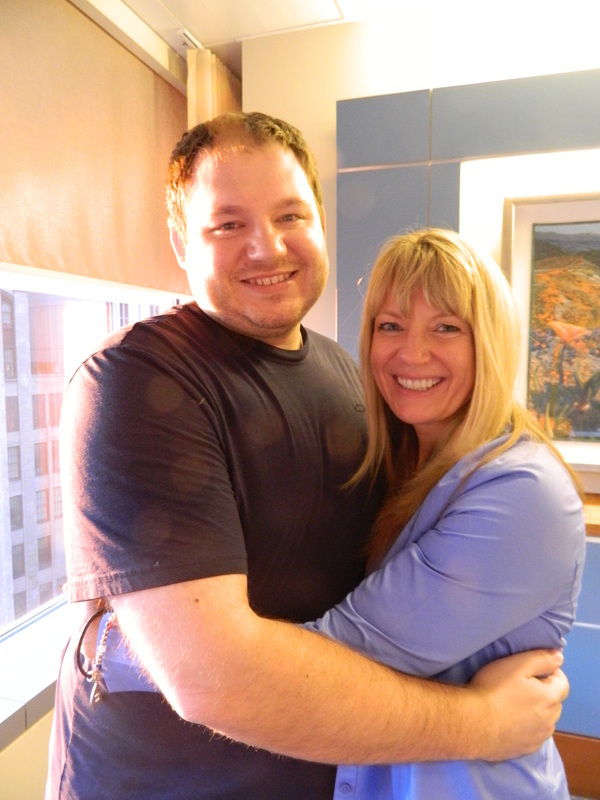 The results of the MRI will be in tomorrow & the spinal tap results will be given to Mom & Dad in 48 hours. 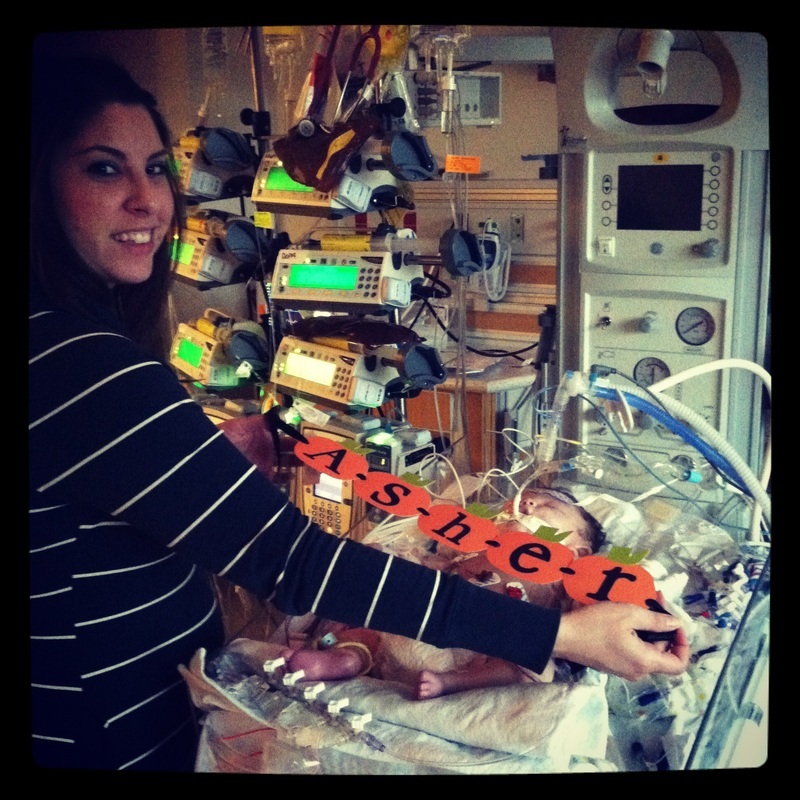 Asher's MRI showed no signs of stroke, seizure, or blood clots. The Infectious Disease doctors visited Asher today to do further testing because the cause of his fever still cannot be determined. His fever is being controlled with antibiotics & Tylenol. Asher is no longer on Morphine, but is on other medicines to control pain, to wean him from the morphine, & to keep him resting comfortably. He is still in isolation due to the possibility of a contagious infection. Hopefully we will know more tomorrow when the results of the tests come back. Mom, Dad, & Auntie took a CPR class today to be prepared for when Asher gets to come home. Cysts were found on Asher's kidneys which concerned us because Asher's mom has PKD (Polycystic Kidney Disease), but the doctors do not think Asher has PKD so that is a relief. They think the cysts are caused by an infection & a lack of blood flow. There was also some concern that Asher may have inherited a blood clotting disorder, but the tests for this came back negative--that's a huge relief. 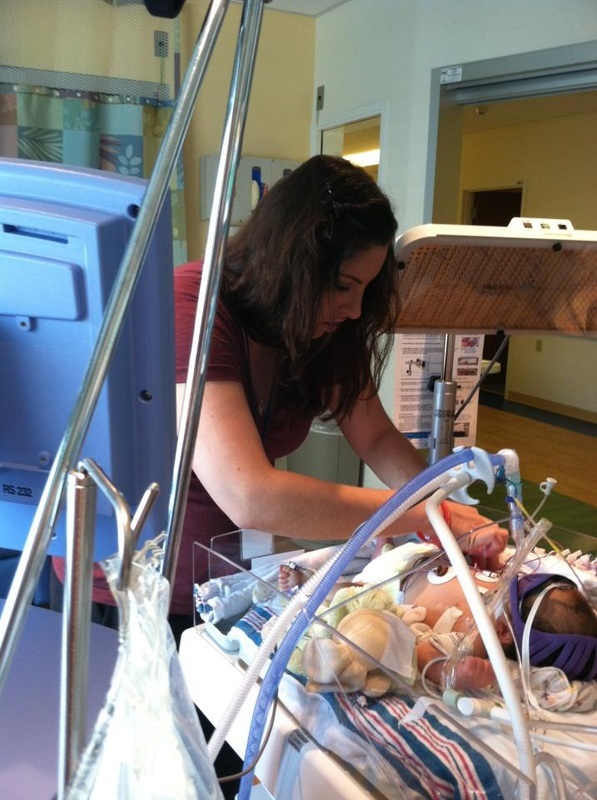 Asher is still having difficulty tolerating breastmilk so further testing will be done to determine the cause of this. There is fluid accumulating along Asher's back muscle. The doctors are looking into this as well. Today has been an up and down down--repeated concerns & possibilities of additional issues, but also relief as tests have come back ruling out more hurdles for Asher to overcome. The Infectious Disease team finished evaluating and testing Asher and they haven't found any infectious diseases. The day started out with good news. The neuro team cleared Asher of any brain issues. He will have follow up visits with the neuro team throughout his life to make sure he meets average development markers. 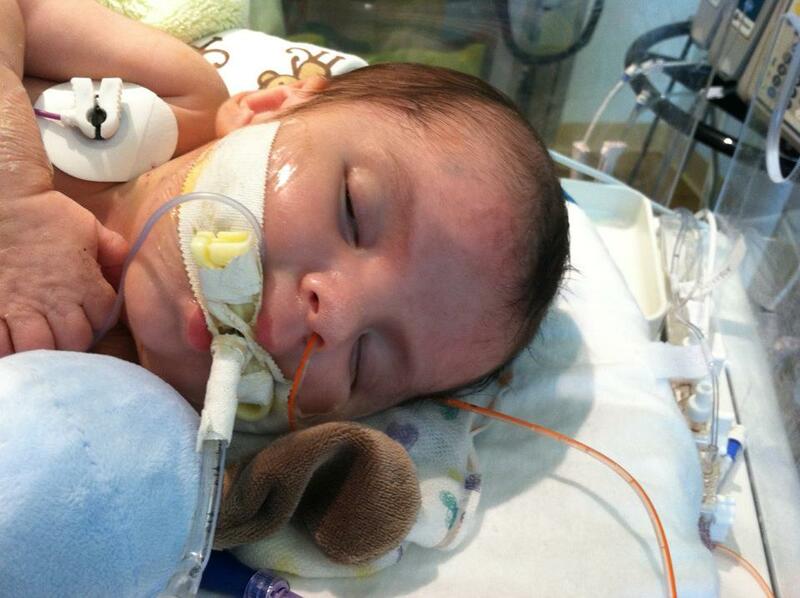 The settings on his ventilator have been lowered--that's one step closer to removing his breathing tube. Asher even smiled today! Mama was making a video for daddy & was talking to Asher & he smiled for the camera. The monitor on his forehead came off so we can see even more of his sweet little face. Asher wasn't able to get back started on milk today, but hopefully tomorrow. Check out a video of sleepy Asher smiling by clicking HERE! Asher continues to make progress & tests continue to come back negative ruling out additional issues. Asher is headed in the right direction and things are being moved forward slowly. We were hoping that he could have his breathing tube removed today, but the decision has been made to wait until Monday to try that. 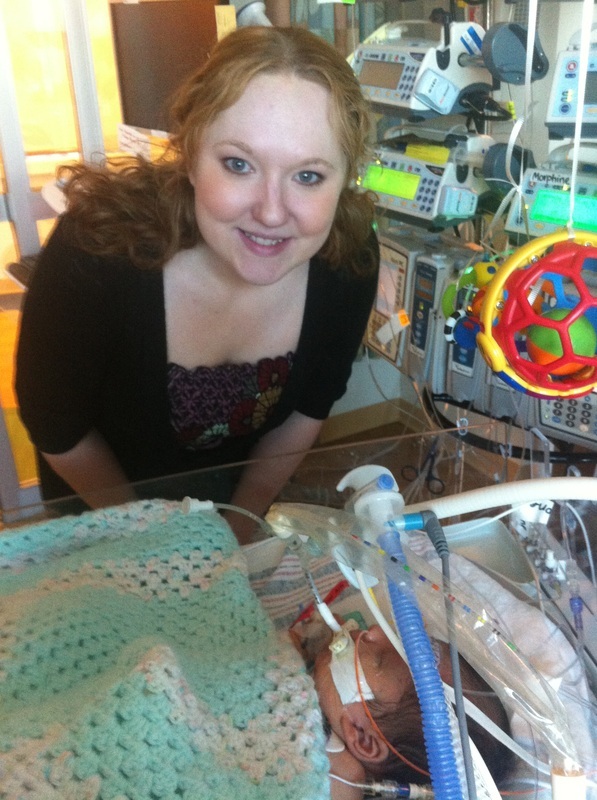 If all goes well, enough tubes will be removed on Monday so that Asher's mommy & daddy will be able to hold him! Asher will be 1 month old on Wednesday! Asher is very active and alert today. Asher worked on breathing exercises today to get ready for Monday. 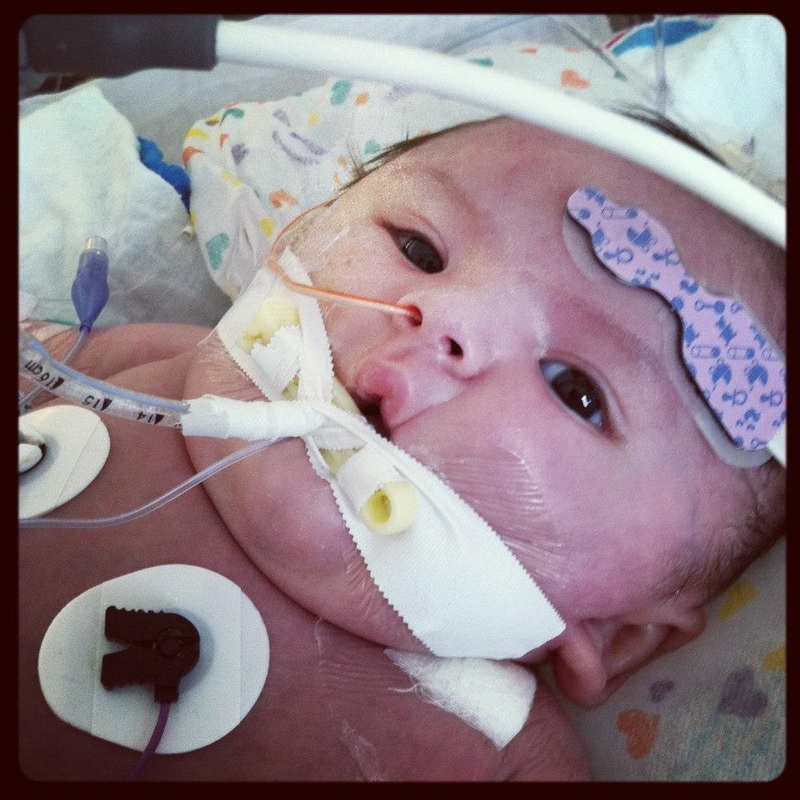 On Monday Asher will get to have his breathing tubes removed. He is a little bit puffy today. Asher still hasn't been able to be fed milk & they are still looking into the cause of this. Today is a crazy day in Chicago. It's the big Chicago marathon. Daddy tried to get downtown to see Asher, but had to go back home, wait, & drive back down again because that part of the city was blocked off for the marathon. Asher is still unable to be fed milk & he is still looking puffy. He will have a CT scan today to look for a clot around his central line that may be causing the swelling. He has fluid build up in the chest, neck, and some in his face/head. They had to put in a chest tube to drain this fluid. 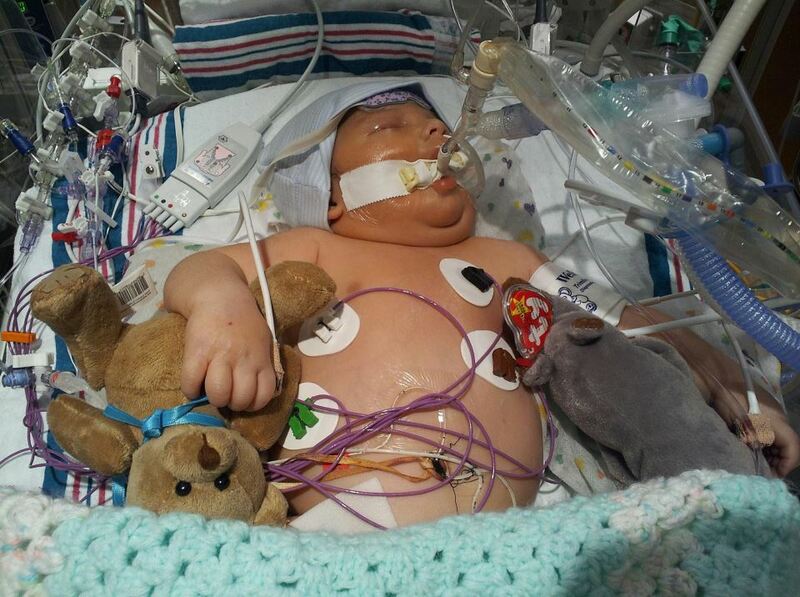 Asher will not have his breathing tube removed today because of the complications he is experiencing. 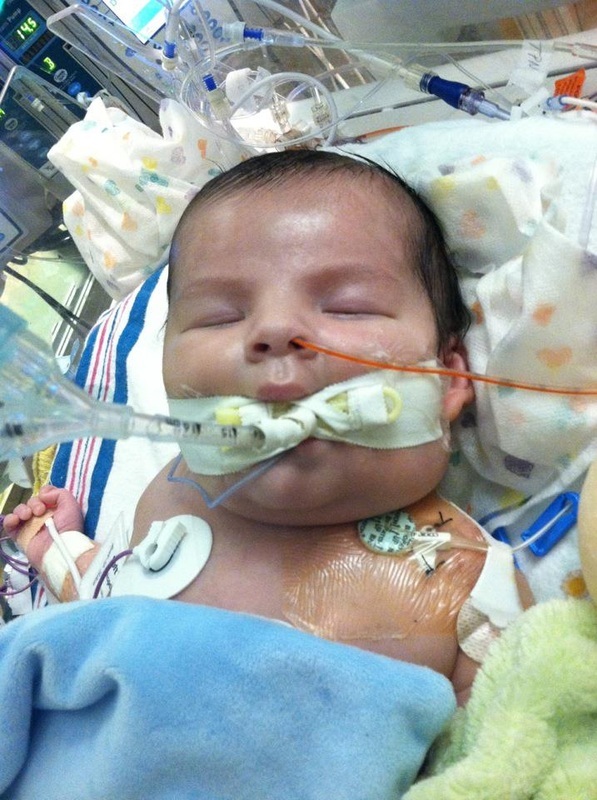 There is fluid around Asher's lung so a chest tube was inserted to drain this fluid. The CT scan showed that the facial swelling is caused by a blood clot that formed in Asher's neck around an IV that was placed there. Asher will be on blood thinners for the next 6 weeks and the doctors are trying to decide whether they should specifically treat the blood clot or attempt to let Asher's body work it out on its own. Both options have risks. They are weighing the risks vs. benefits to choose the right course of action. 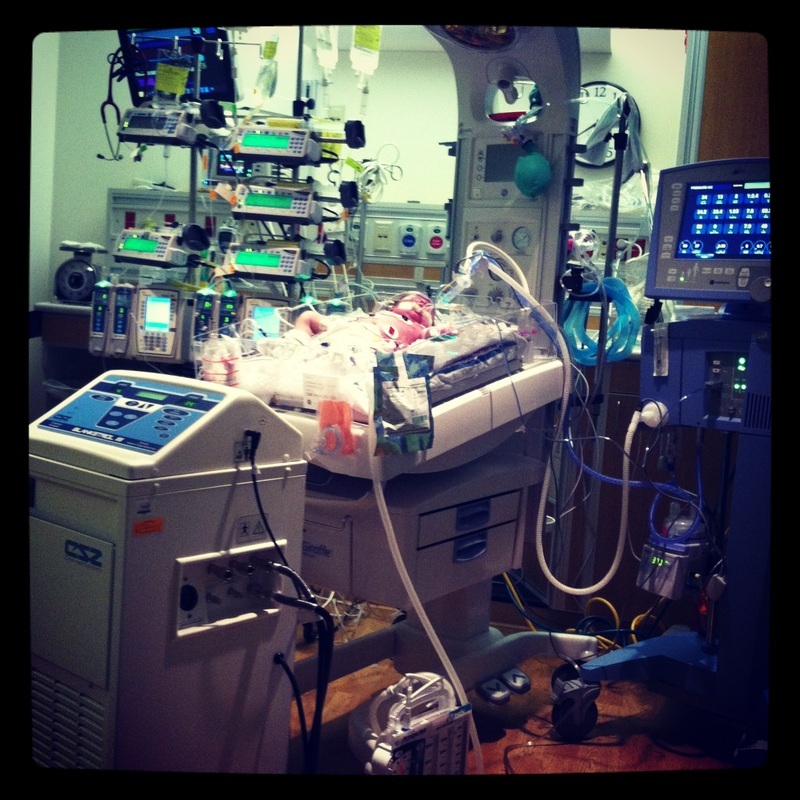 When asked if Asher would make it through this, the doctors could not give us a definite answer. We are praying. 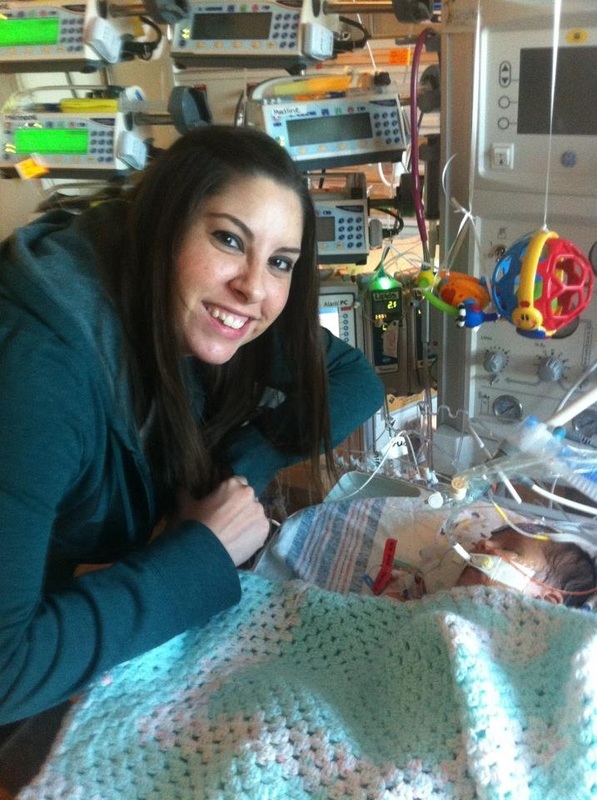 Some of the treatments Asher has been on have helped his kidney function. Those numbers are looking better. We are progressing carefully with the blood clot issue, but the doctors are cautiously optimistic. Uncle Jeremy & Auntie visited today. We missed Asher so much! Unfortunately, Asher has some severe challenges right now. He has bilateral blood clots on his jugular veins on both sides (and several smaller clots on veins throughout his chest). These clots are making it difficult for blood to get into the right side of his heart (and Asher already had difficulty pumping blood out of the left side). These clots are restricting blood flow to mainly the top portion of Asher's body & are causing fluid to accumulate in his chest/back area. This fluid is being drained, but with it goes important things such as albumin & protein. These fluids & nutrients can be replaced, but they'll "leak" right back out in the same cycle. The blood clots need to be cleared, but the question now is how to do that safely. There are several options on the table & the doctors are supposed to have more information & advice tomorrow morning at 7am. We'll be there bright & early to hear what they have to say. If we don't remove the blood clots, Asher will continue to lose protein & to not have the blood flow he needs--causing his heart to continue to work much harder than it should be. He will get sicker each day. If medication is given to get rid of the clots, the medication is indiscriminate--meaning it will get rid of all clots in Asher's body--and some clotting is good & healthy. There is a risk of internal bleeding or bleeding into the brain. In adults they can use equipment to physically go in & remove or break up clots, but it is much more difficult in a baby of Asher's size & in his condition so physically removing the clots may, in some ways be safer than the medication, but may not be an option. This is a very serious step that needs to be taken and we're praying for a safe & positive outcome for Asher. He has fought SO hard every step of the way & we believe that this time he will do the same. And when we woke up this morning, others were doing the same! While we sat with Asher today, each time a new picture came we said, "Asher you got another one! Look it's a dog dressed up like batman!" or "This one has your name spelled out in heart shaped buttons!" Instead of sitting silently, worrying, waiting for the next update, we smiled & laughed at the pictures that were coming in. We printed them out on Auntie's Pixma photo printer & put them up on Asher's window. And by the end of the day we had 78 pictures & 2 videos! And throughout the evening, without any additional treatment, Asher started to look better & better. His coloring became more normal & some of the swelling & fluid went down. Maybe all that love you're sending is working miracles? Please keep those pictures coming! 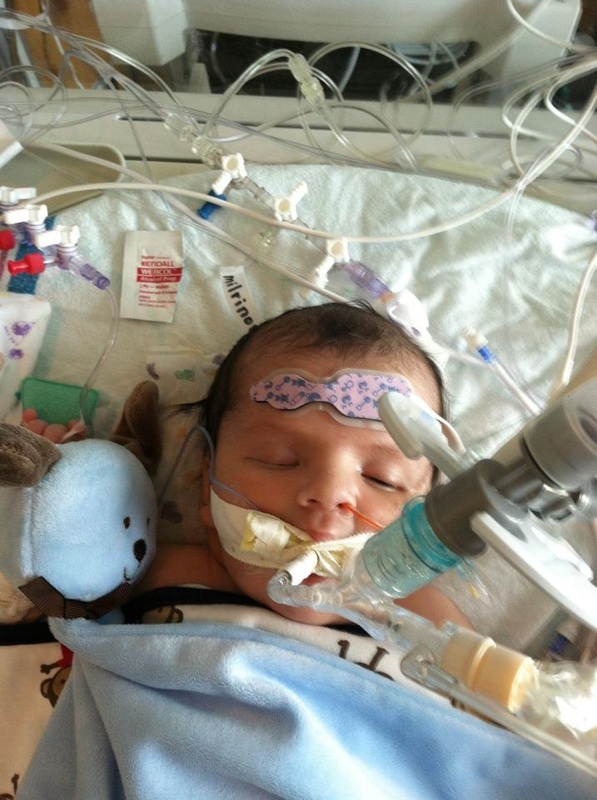 The support is giving Asher & his family the boost they need to keep fighting. It's been a long road, but we won't stop fighting for our little guy. Go Asher Go! 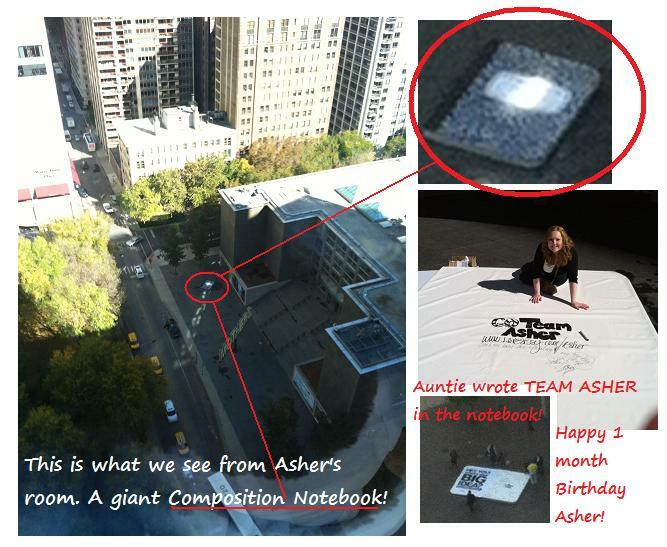 Team Asher! Asher's condition is very serious & after meeting several times with teams of doctors, an option to treat his blood clots has been chosen & administered. The least invasive option wasn't an option for Asher's situation, so the 2nd lease invasive option has been chosen. A medication has been administered that we are hoping will break up the major clots enough to allow blood flow to the parts of his body that are, right now, completely blocked. There are risks involved with administering this medication. The clot can break apart in large pieces & can travel to Asher's heart or brain & the medication itself can cause uncontrollable bleeding. But, we are praying that none of these things happens. Without breaking up that blood clot Asher will continue to get sicker. Fluid will continue to accumulate & he will continue to expel necessary proteins (among other things) that sustain his system/immune system. This blood clot must be broken up in order to take some of the pressure & stress off of his heart to give that right side a break & to allow blood flow throughout both sides of his heart & lungs. Asher is being monitored closely & is being given several other interventions to minimize the risks. We will do frequent updates & will know a lot more in 24 hours. Right now Asher looks better than he has in days. His coloring is great & they've found the right combination of medications that have him resting peacefully and have him calm, happy, & not in pain. He even opened his eyes for us quite a bit today despite being on a sedative & a low dose of the paralytic. He was happy & peaceful during this time & we are thrilled to see him looking so well. This is a critical time for Asher & we have no doubt that the love everyone is sending through their TEAM ASHER photos is helping to lift him up. The pictures are lifting the spirits of Asher's mommy & daddy (and the whole family). This is a stressful, emotional, terrifying time at times & the pictures keep coming...every few minutes...and they remind us of all the love that surrounds us & of all we have to look forward to when Asher can finally come home. Some pictures are silly, others are creative, some adorable, some hilarious--we love them all. Thank you & please keep them coming! 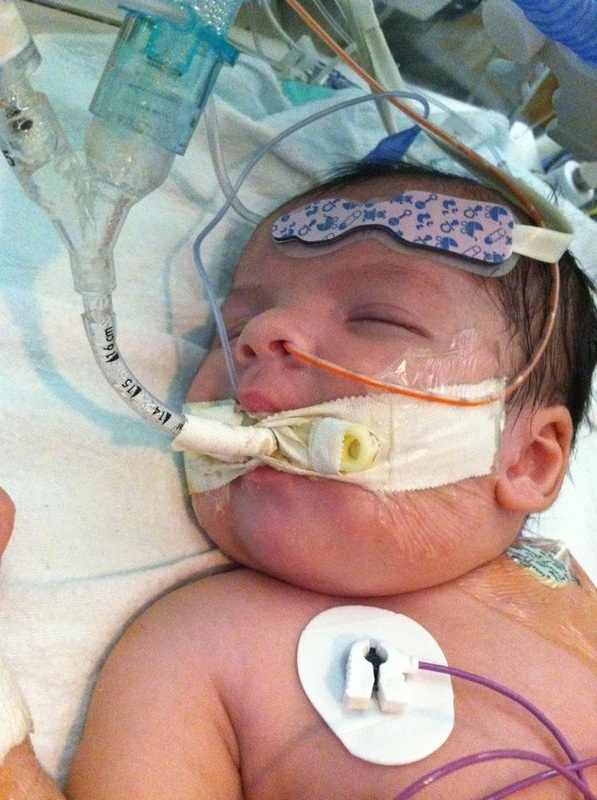 In the early a.m. hours Asher's breathing tube wasn't working as it should've been. We found out later that this was because a portion of his right lung had collapsed. His swelling significantly increased throughout his entire upper body & in his left leg. He was in obvious discomfort & despite being on a paralytic & sedative, Asher was able to wiggle his foot & toes multiples times. It became obvious that he was not on enough of the paralytic & sedative medicines & those doses were increased. By 1am the medicines were working well & he was resting more comfortably. Some of the swelling in his upper body decreased slightly, his coloring improved, & the swelling in his left leg went away almost entirely. We are still waiting to see signs that the blood clot may be breaking up, but so far we have not seen signs of this. However, it would be unusual for the medicine to work that well that quickly, so we were not expecting to see significant signs of improvement in this amount of time. We are continuing to stay with Asher overnight & will post updates on his progress. He will have ultrasounds in the morning & around 2pm will go for the procedure we mentioned in yesterday's update. 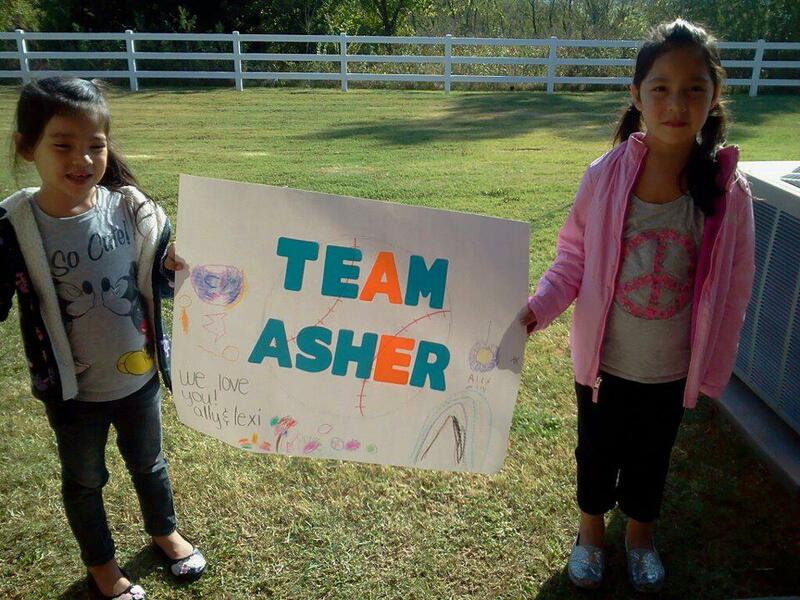 Please keep those TEAM ASHER pictures coming! Unfortunately, Asher had a very active & eventful morning. His swelling increased to a point where he looked/felt/acted like he was in quite a bit of discomfort. A portion of his right lung collapsed & fluid was found in the right side around his lung (instead of only on the left). There were a variety of issues that took place throughout a very nerve wracking morning & it became evident that the only way to help Asher was to perform the procedure were a catheter is inserted into the area of the most severe blood clots & medicine is given directly into the area of the clots to get them to break up. Teams got themselves into place & Asher was eventually taken into the procedure around 5pm. Asher being taken to the procedure. 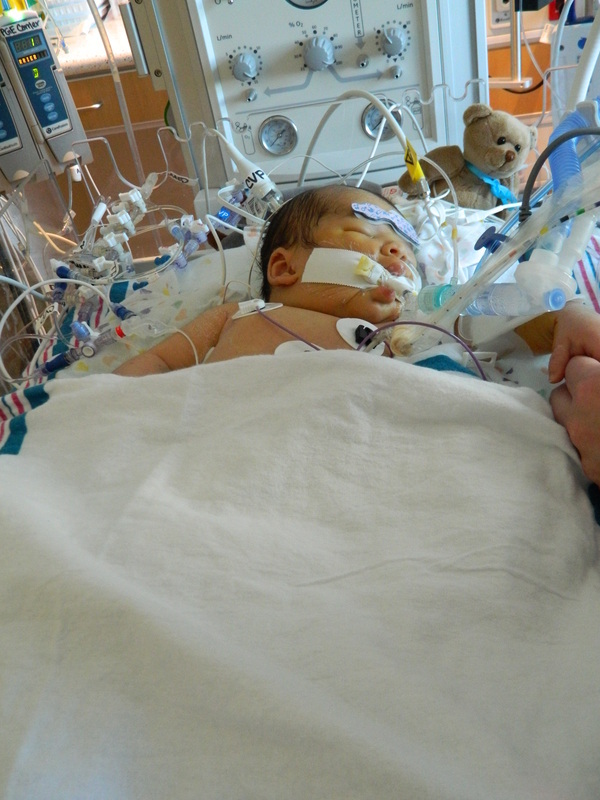 The team attempted to insert catheters through both arms into both sides of Asher's chest, but they were only able to insert the catheter into the right side. However, they had good placement on this catheter & they will deliver all the medicine through the one they successfully placed. The medicine should spread throughout the entire area & be able to reach all the clots they want it to reach. Asher was brought back to his room around 6pm & they began administering the blood clot breaking up medicine around 7pm. This medicine will take days to do what it needs to do, but Asher is already showing signs of improvement. His coloring has improved & some of the swelling has decreased. Some of this is due to the fact that the doctors inserted an additional chest tube to drain Asher's right side along with his left. Asher is still very swollen & he is still very sick, but we are hopeful that this medication will do its job & will give Asher the chance he needs to get his circulation going & to begin the healing process. As of 10pm, Asher is resting comfortably & he is stable. The nurses are working very hard tonight to keep Asher heavily monitored & to administer all of his interventions, treatments, & medications. (We LOVE Asher's nurses!!!) He is in really great hands tonight & we are hoping to see Asher looking even better by morning. Throughout the day, family & friends & new friends have been sending Asher's family TEAM ASHER pictures & these have made such a difference in our morale. 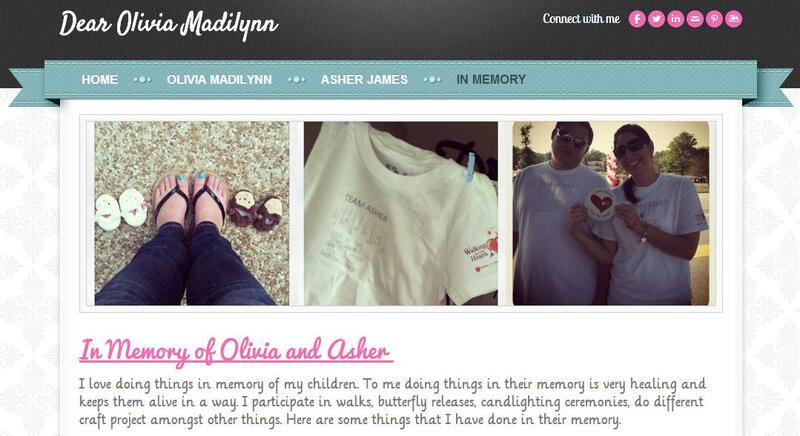 We feel that there are so many people on Asher's side & that he can feel all of that love. It's a terrifying experience to turn Asher over to the team of doctors (even though they are wonderful!) & to see him be wheeled away knowing that this is a true life or death situation. But we had such an outpouring of support that it boosted the faith we have in Asher. and helped us to stay strong during the most difficult of moments. We all truly believe that Asher is strong, that he is fighting hard at every turn, & that he is here with us for a reason. Thank you for loving our little guy & for showing him how many people are on his team. Asher has taken on the first half of this process like a champ & we are now waiting to see if this medicine can break those blood clots up to save Asher's life. 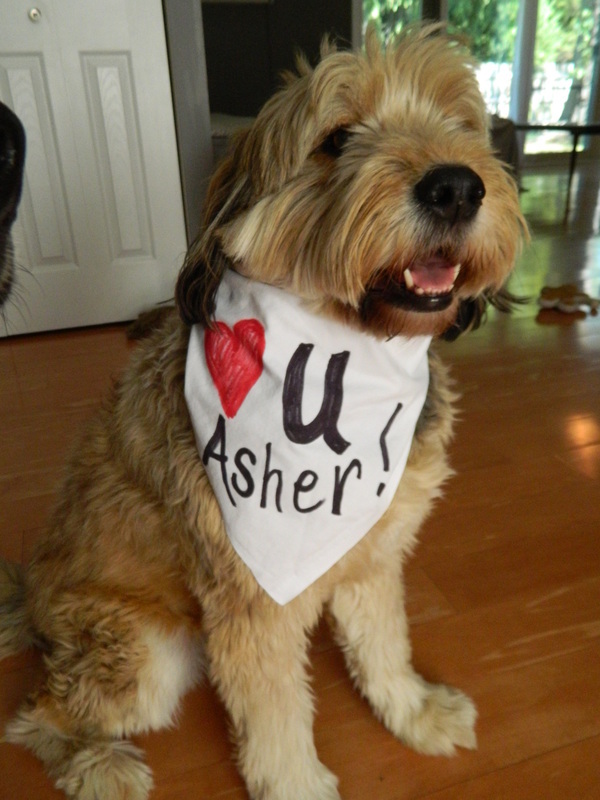 We will continue to update frequently & please keep those TEAM ASHER pictures coming! Thank you to everyone who changed their profile picture to their TEAM ASHER picture today in support of his big procedure! Asher is back on Lasix to try to get rid of some of the fluid build up/swelling around his body, especially in his head. The clot busting medicines have been turned up & a high dose is being given for 8 hrs. We will know after tomorrow's ultrasound if it is working. Asher is tolerating the medicines well. He is doing amazing & is really fighting! He is being monitored very carefully or clotting in the brain, heart, & lungs and for internal bleeding. Asher is very swollen, but as the clots break up that swelling should go down. More TEAM ASHER pictures keep coming in & everyone at the hospital loves them. Hospital staff keep coming by to see how the display is growing & we even think that these pictures are motivating the doctors. No new update on Asher. He is stable & fighting. 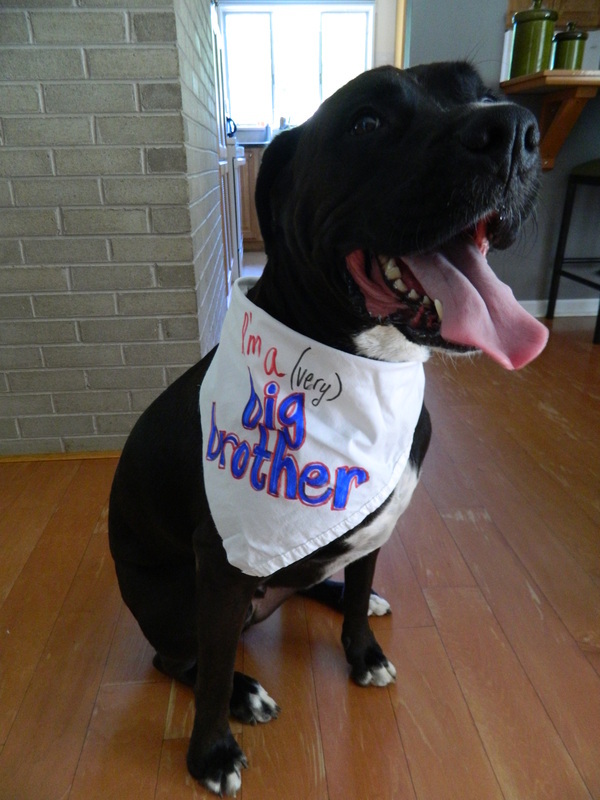 He had an ultrasound this morning & the results were received around 8pm. The procedure & medicine are working!!! Asher's blood clots are being broken up! And they're being broken up on both sides of his body even though during the procedure they were only successful at putting a catheter into one side!! Thank you to everyone praying for Asher! The love & positive energy is working! Keep those prayers & pictures coming! Asher was taken off the paralytic & we are waiting for him to move & respond. The ultrasound came back not showing the clot breaking up the way they had planned so they are keeping the dosage at the high rate tonight which means a greater chance for internal bleeding. If this doesn't show improvement in tomorrow's ultrasound then they will discuss other options to remove clots. The other options have higher risk & may not even work in Asher's case. We just have to stay hopeful & positive that our little guy will pull through this. We got some really awful news this morning. The doctors told Asher's mommy (based on the ultrasound results) that if this medication (TPA) doesn't work then there are no other options & Asher won't make it. So today they took Asher to the IR (Internal Radiation) to inject dye into his veins to get a more accurate look at whether the clots have been broken up enough to allow any flow through his body. They called during the procedure to let us know the clots ARE being broken up (which after the ultrasound they did not think this was the case) & that they have more options than they thought they did based on what they were seeing. They did an angioplasty to open up as passageway to move clots out of the way. They also put a catheter in through Asher's right arm, through his heart, over to the left side of his body to attack those clots (the clots around his IJ--Internal Jugular). Asher made it through these procedures & he is resting comfortably in his room. He has been taken off the paralytic & he was opening his right eye today. He was trying to open his left, but the left side of his body is more swollen than his right & it is difficult for him to open that eye. He is still very swollen because the blockages in his veins. His arteries are open so blood, etc. can make it up to the top half of his body/head, but it has trouble coming back down & out so the top half of his body swells. We are hoping that the swelling will go down so that he can be more comfortable & can open those beautiful eyes of his all the way. 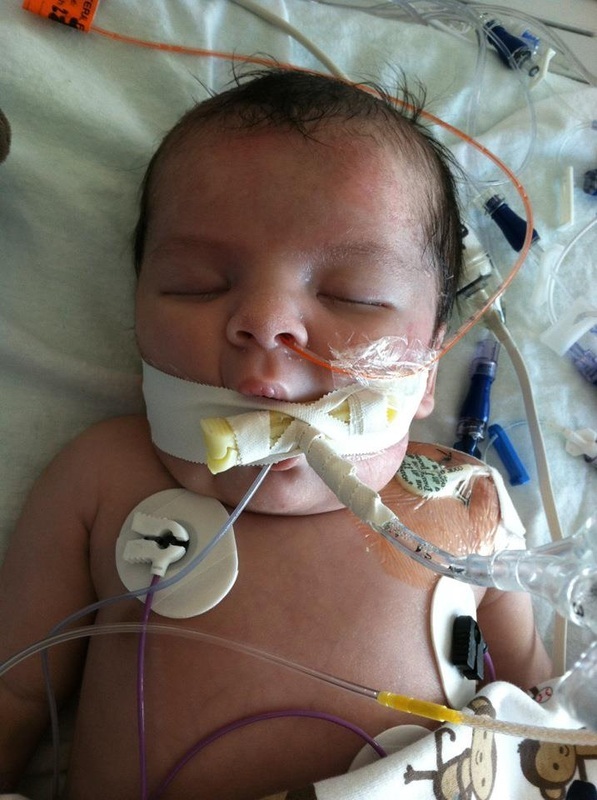 It is heartbreaking to see him in this condition, but at the same time we think he is just the most beautiful baby. We love him more every day! He is being so strong throughout all of this. Our hearts ache at how he has spent the first 5 weeks of his life, but we are moving in the right direction & we are very hopeful that all of this will soon lead to a healthy, happy life for Asher. We appreciate the prayers more than we can say. Please keep them coming. We believe they are working & we feel your love & support around us. We print & display every TEAM ASHER picture that gets sent to us. Auntie made a new team Asher sign for it & one of Asher's favorite nurses Lawren took her Team Asher picture with our little guy! Lawren is a great nurse & Asher loves her! Asher's clots are breaking up, but the doctors think that he is reclotting just as fast as they can break them up. They've tried a low dose of the clot busting med & a medium dose & a pretty high dose for long periods of time & this just isn't enough. The risk of bleeding increases with each increase in the dose. Their plan now is to give Asher a little break from the meds & then for 6-8 hours give him a very high dose of clot busting meds to see if they can bust the clots up. They've told us to expect bleeding & that we will just need to monitor & tolerate some level of bleeding--that it is of the utmost importance right now to get those clots broken up to restore the flow throughout his body. Asher is still very swollen throughout his body. He is off the paralytic & he is wide awake. He is really trying hard to open his eyes & he can open his right eye well, but the swelling is preventing him from opening the left. His ears and head and tummy and arms are very swollen. We know there are a lot of risks & it will be a tense time while Asher is on this high dose (later today), but it is his best (and only) option right now so we are staying hopeful that this will knock those clots out & let his body heal/unswell so he can be more comfortable & can be more alert & active without all this fluid built up all over his body. We love this baby! 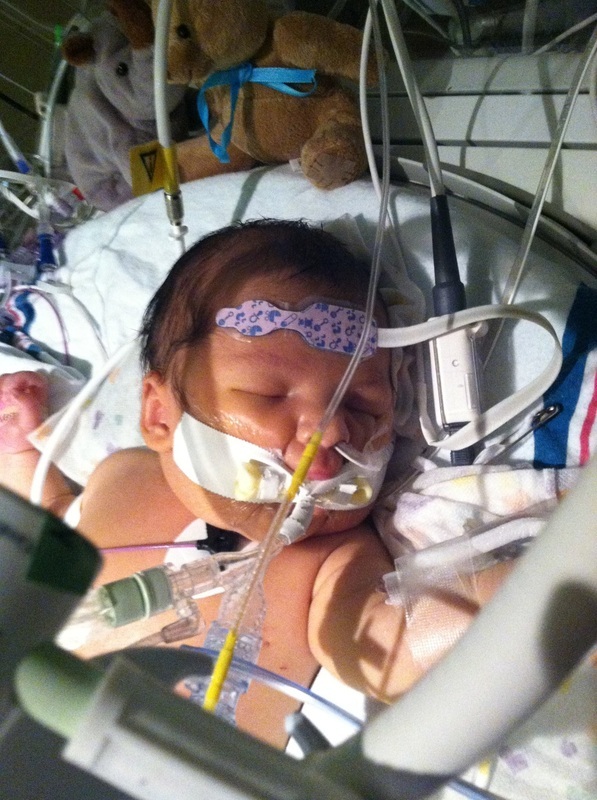 We're praying hard & Asher reminds us every day to keep fighting. He is so strong & sweet & tolerant of all that is being done to him. Update at 3:15pm--Asher is tolerating the high dose of medicine well, there are no signs of any bleeding, & the swelling is reduced enough to where Asher can open both eyes! It isn't a huge reduction in swelling, but it's so good to see his beautiful eyes open! 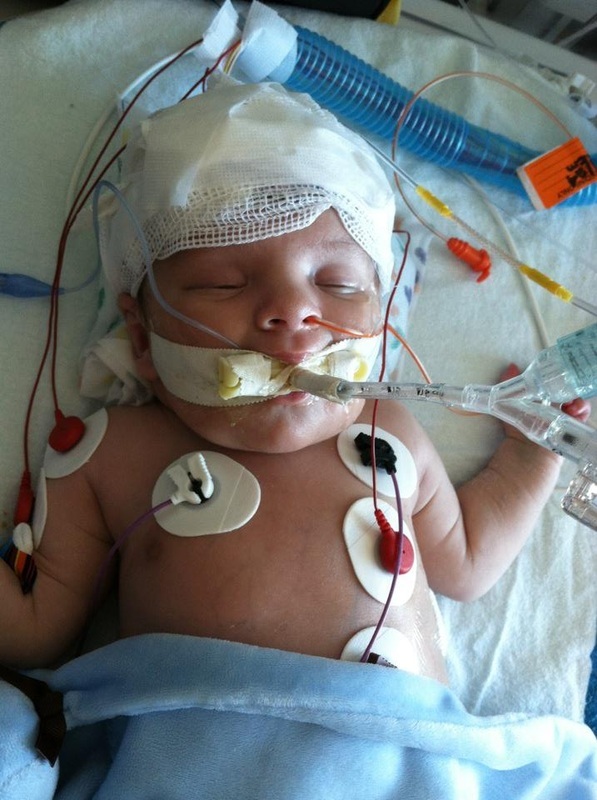 Asher's EEG & Ultrasounds have all come back with reassuring results showing no signs of internal bleeding. Update at 10:00pm--Asher finished the very high dose of clot busting medicine. There was some bleeding, but it was well controlled. The high dose of medicine was stopped 30 minutes early due to this bleeding. The swelling continued to slowly reduce & Asher is resting comfortably. The risks that are being taken as far as allowing some level of bleeding are scary, but necessary. The doctors have made it clear that, at this point, we must break those clots up. Asher's heart cannot take the stress being put on it & without breaking up those clots, they say that Asher will not survive. 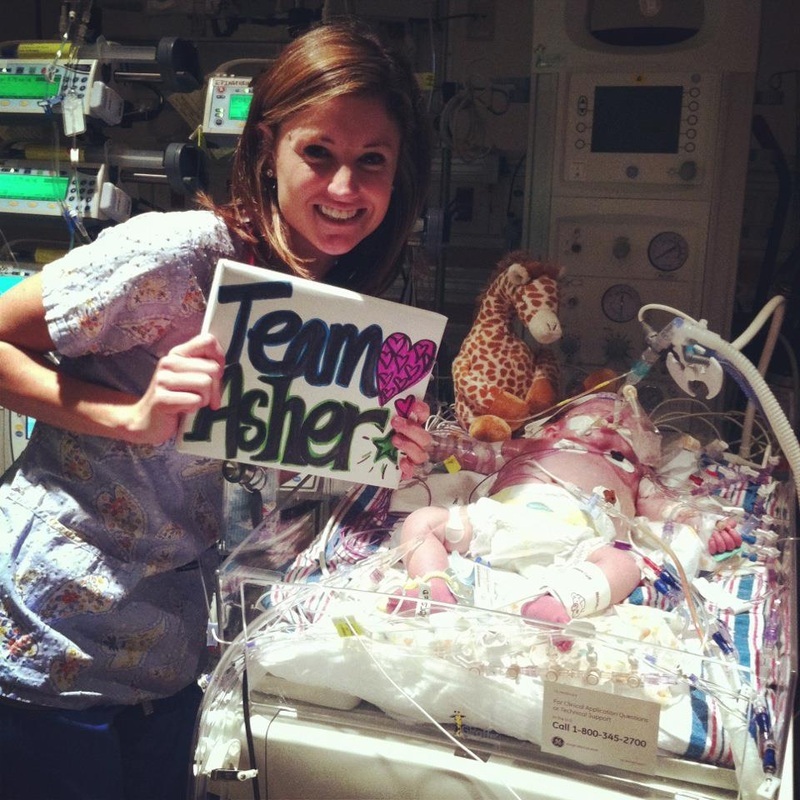 Asher's family has a deep amount of hope & faith and truly believe in Asher & the doctors. Auntie & Mommy are staying overnight to watch Asher during this high risk time. Today Asher had an ultrasound & went to IR (Interventionall Radiology) to see whether the high dose of clot busting medication (TPA) worked to break up his clots. Asher returned safely from the imaging procedure, but we did not receive the news we had hoped for. The TPA medication is not working. Right now we don't have any further information or options, but Asher's mom & dad will meet with the team of doctors tomorrow. Thank you for the prayers for Asher and our family. Mom & Dad met with the cardiologist(s) working with Asher & yesterday's news from the hematologist wasn't entirely accurate. The TPA isn't 100% not working. It is working--just minimally. There is still reason for hope, we aren't out of options, & Asher is making progress. Asher is having a really good day and had a really good night. He has been very alert and refusing to take naps. His mom has been able to talk to him, play with him and read to him. The Hematologist came in and talked to Asher's mom & dad and this time, unlike last night, had only good things to say. She wants to use him in research to help other kids. Asher is growing new veins in his neck which is helping the blood flow but also causing the jugulars to reclot. 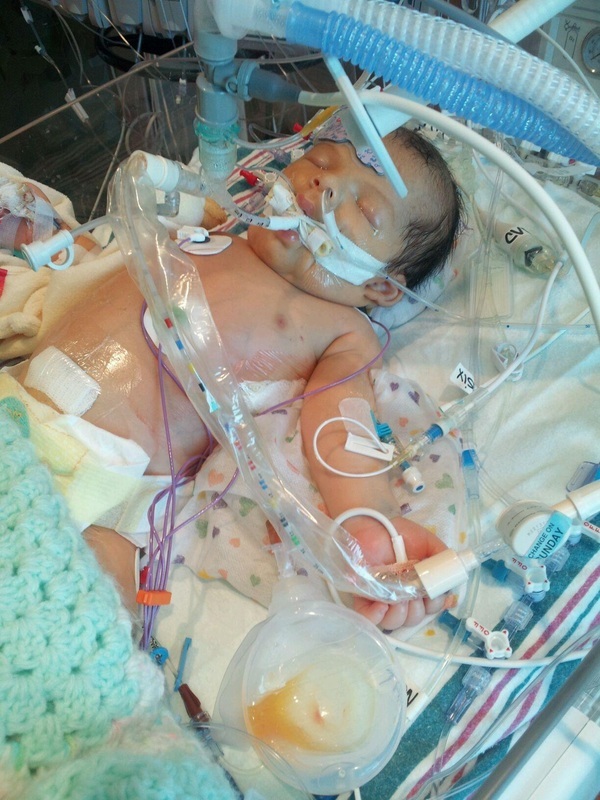 Asher could be in the hospital for months to allow new veins to grow to help with this clotting issue. Surgery to remove the clots is not an option because it is too high of a risk because of his heart condition. At this point we don't know what will happen each day or how long Asher will be in the hospital. We just have to take each day at a time and hope for the best. Our sweet little Asher James had another good day and he had an exciting day! The Channel 2 CBS Chicago news team came to visit Asher & put his story on the 6pm news! Today Asher is stable & is very alert. He is responding to voices (especially Mommy's & Daddy's). Today Asher had a variety of tests--blood tests, another EEG. Right now it's a waiting game. We are waiting for Asher's body to grow new veins (collateral veins) around the veins that are clotted to carry blood throughout his body. 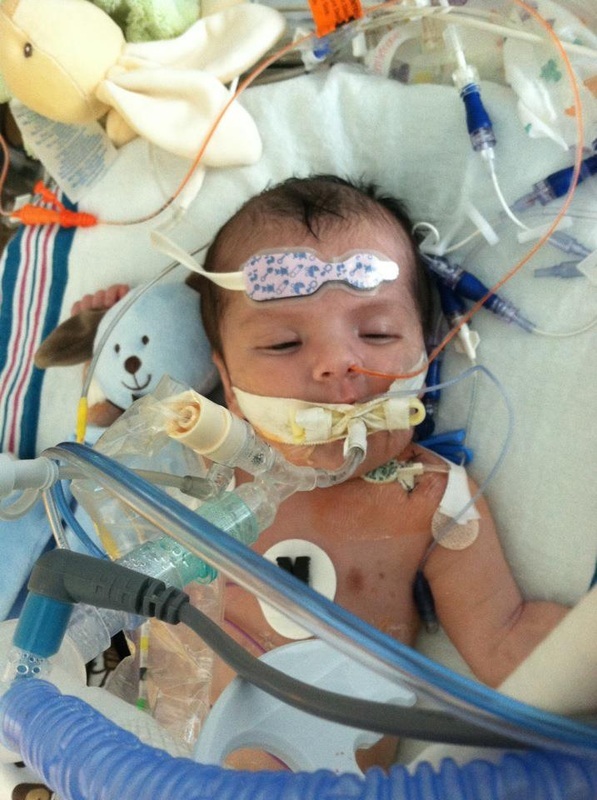 Once Asher is over this blood clot hurdle, we can again begin focusing on his heart issues. For now though, it's one day at a time & we are grateful for every moment we get to spend with Asher. Auntie & Grandma visited today. 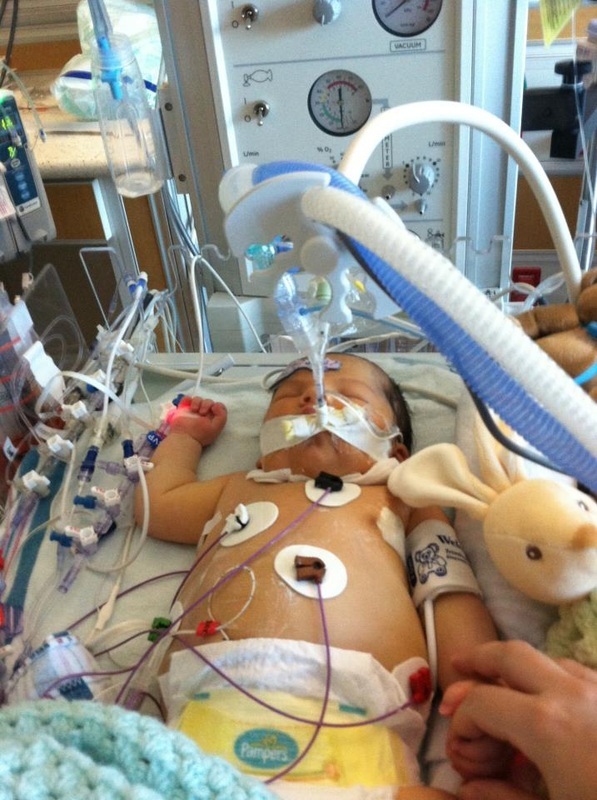 CLICK HERE to read the CBS news story about Asher's fight. Another good day for Asher! The doctors say he is slowly, but surely heading in the right direction. The only additional issue today is that Asher's blood pressure is dropping, but the doctor's are working to get that figured out. 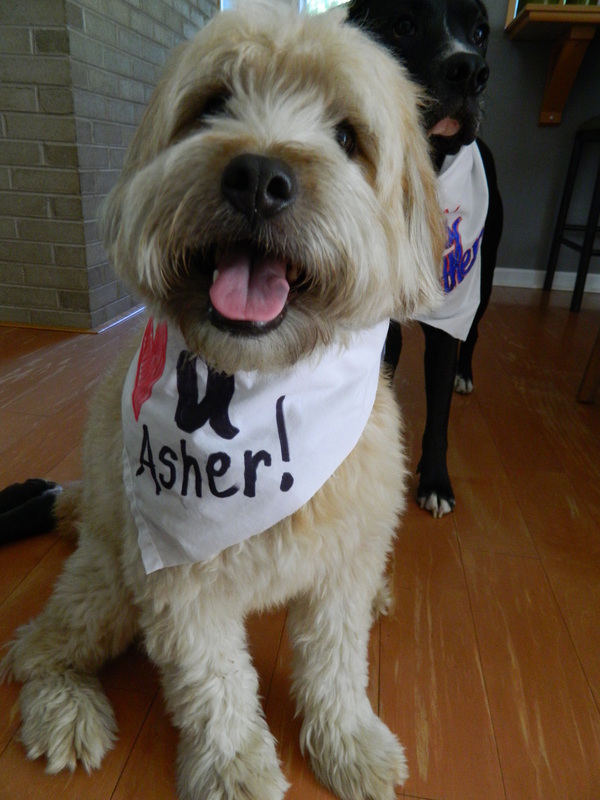 Asher's story ran again on Channel 2 this morning & we're loving all the TEAM ASHER pictures that are coming in! Mama is calling Asher her little puzzle piece today because sometimes we just can't seem to find the right combination of pieces to keep Asher stable & headed in the right direction. Today was one of those days. Asher is both retaining fluid & dehydrated. Asher's swelling was going down because they had him on Lasix, but it's tricky to get the dosage just right. They don't want Asher to get dehydrated (which happened previously & then his veins were "blowing out") so they've been giving him fluids to replace what he is losing in his chest tubes, but this has increased his swelling again & because he is losing the fluid through the chest tubes his body is not getting any of the nutrients/proteins/hydration benefits thus creating the dehydration. Asher's blood pressure has been up & down too unfortunately & they are having a difficult time keeping him at consistent, stable levels. He is having some circulatory issues & his foot/leg has turned purple off & on today. 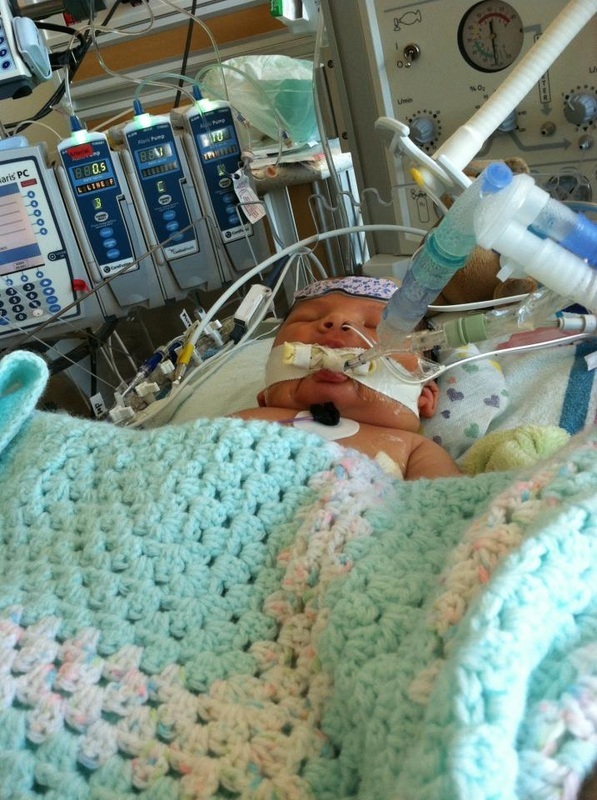 Asher's ventilator settings have been slowly turned down, but due to the increased fluid & swelling he is having more difficulty breathing so they've had to go back up on his ventilator settings. Tomorrow Asher will have another ultrasound to try to determine the cause of the purple feet, swelling, etc. & he will have an echocardigram to check on his heart. They were going to bring him back to IR (Interventional Radiology) to get a better look at the state of his blood clots, but that will most likely be pushed back at least a day. The ultrasounds & echocardiogram can be done right in Asher's room with no anesthesia (as opposed to the IR procedures which do need to be done in the IR lab, under anesthesia) so these aren't a big production/risky for Asher. The trips to the IR are risky & challenging. Luckily Asher has an amazing team that does a great job of keeping him stable each time taking him to a procedure is necessary. Please continue to send your prayers & pictures for our sweet little guy. Go Team Asher! Auntie Decnie is visiting Asher today. Asher's other uncle & aunties can't wait to meet him! Only certain ages/types of visitors are allowed in to see Asher right now under very strict guidelines, so Asher's uncle Larson (age 10) & Auntie Audrey (14) & Auntie Em (16) haven't yet met their nephew. And of course Asher's Oklahoma aunties also can't wait to meet their nephew. 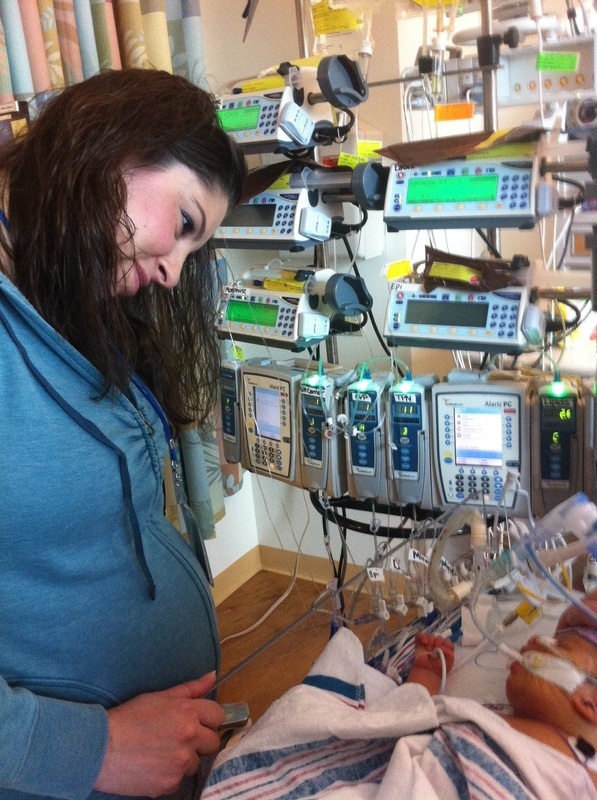 There are so many family members & friends looking forward to the day when they can meet this strong little guy! And there are quite a few things our family will truly treasure when their days come. Asher's mommy & daddy haven't yet been able to hold their baby. That will be a truly beautiful moment. And of course the day that Asher gets to go home will be one of the best we can imagine. We're praying hard for that day! Asher is having a very difficult day today. 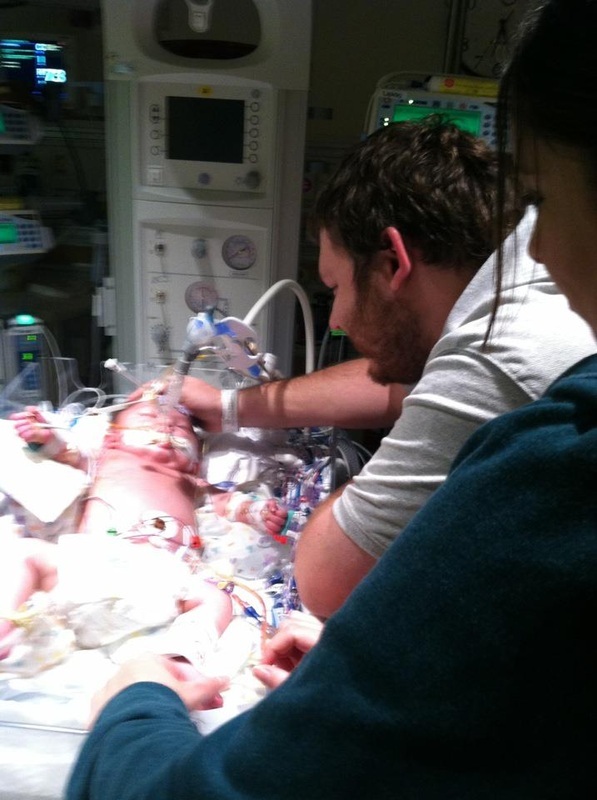 He is having trouble breathing & is not breathing at all on his own (the ventilator is entirely breathing for him today.) They had to put Asher back on the paralytic so he is paralyzed & sedated. We are waiting for ultrasound results to determine the cause of this setback. Asher also had an XRAY & an echocardiogram. By later in the evening, Asher was improving. 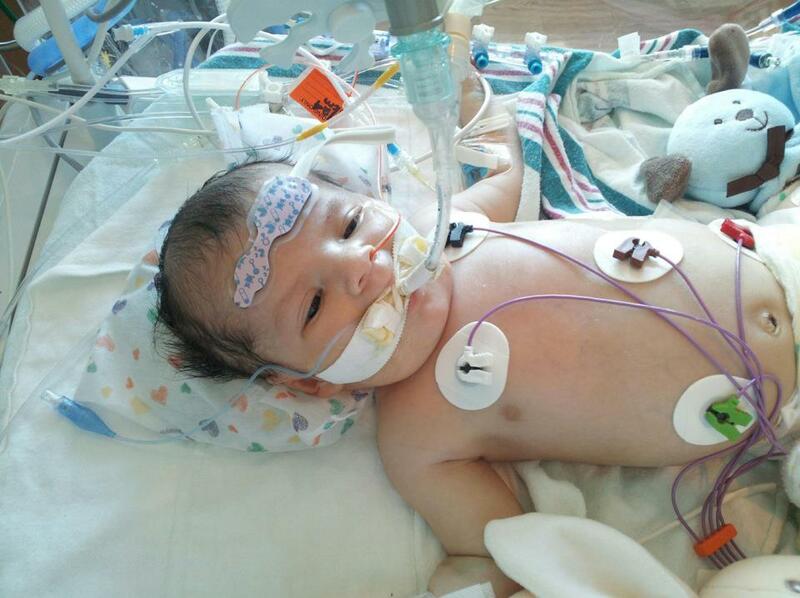 His chest tubes had become clogged, but the doctors were able to unclog them to allow some of the fluid to leave his body. Asher's Potassium level is a concern right now, but the doctors have said that is manageable with medications. He has his favorite night nurse & we're hoping for a good night for Asher & some great improvement in the morning. When I wrote the words above, I had no idea it would our last day with Asher. Throughout this journey I have never wavered in my firm belief that Asher would overcome these obstacles & would come home to live life with us. I never, for a moment, believed we would lose Asher--he was so much a part of our worlds & hearts that I couldn't imagine life without him. I was devastatingly wrong. Just before 2am on October 23, 2012 We lost Asher. Auntie, Uncle Jeremy, Grandma Susan, Auntie Em, Auntie Audrey, & Uncle Larson all came to the hospital at 2am to be with Mommy & Daddy and to say goodbye to our beautiful Asher James. There is nothing more painful than the emptiness we are now left with. In the earliest hours of the morning, Asher's blood pressure dropped & that beautiful heart of his just couldn't hold on any longer. He left this world and returned to where he came from--Heaven. Every moment of Asher's life was a gift and losing him leaves a hole in our hearts like nothing else could. Our beautiful boy had such little time here with us but his time, if measured in impact, far outreaches most of those that live until they are old & grey. His story and him, just him, his spirit, his courage, his loving self, touched so many people. 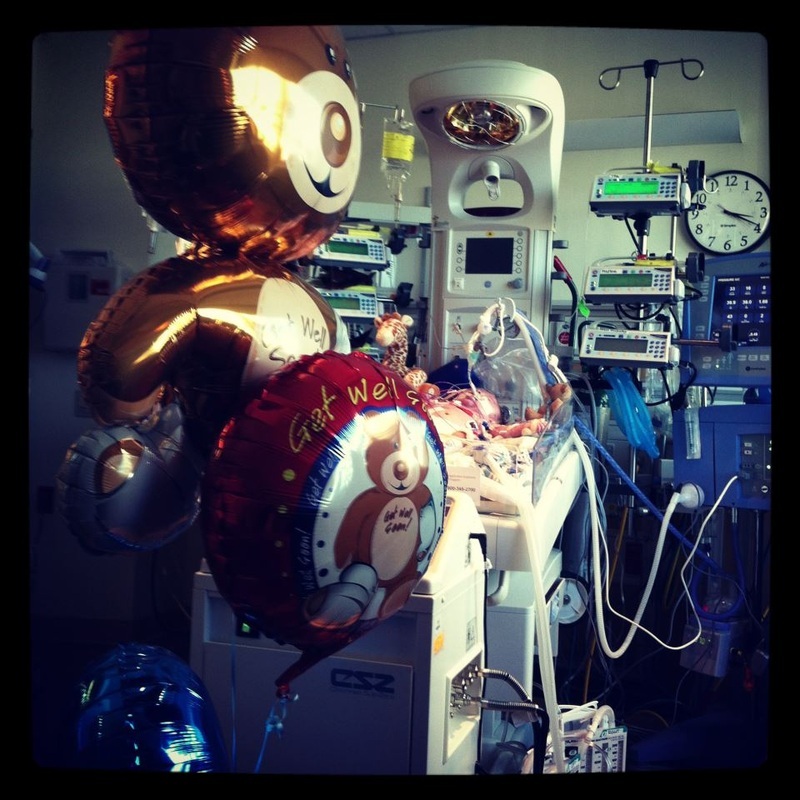 As news spread of Asher's passing well-wishes, love & support came in from far & wide. So many mourn along with Asher's family today--mourn the loss of a beautiful little light. And although this path has been painful and is now heavy and unbearable, I would do it all over again--I wouldn't trade a moment of Asher's precious life. I am lucky to have known this baby, I am lucky to have loved this baby, and I will be lucky when I again one day see Asher--playing happily, with no tubes or wires or machines. We held our sweet Asher for the first and last time today and despite the overwhelming grief, I was at the same time filled with love for this beautiful little boy. 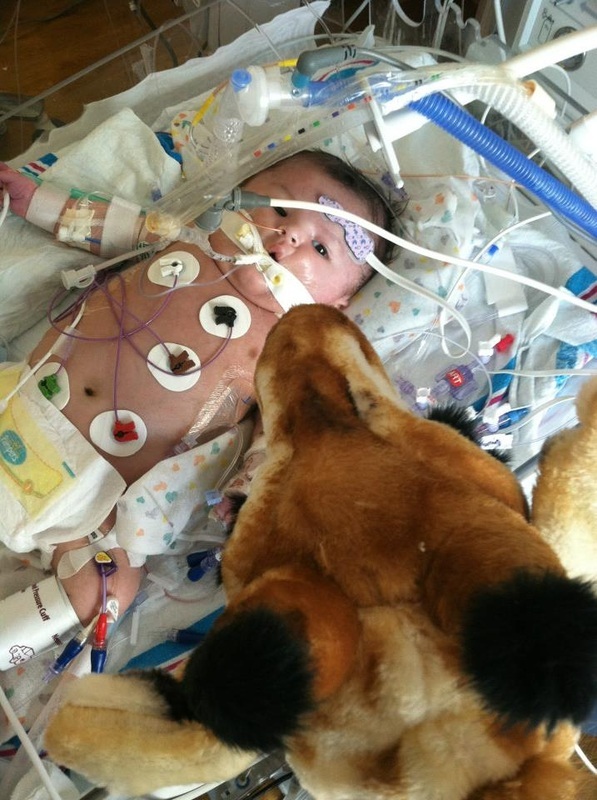 This baby was, is, and always will be a reminder of the most pure, selfless love. The love & dedication his parents had for him. The love & unwavering faith of his family & of all the friends who have heard his story & shared this journey with us. 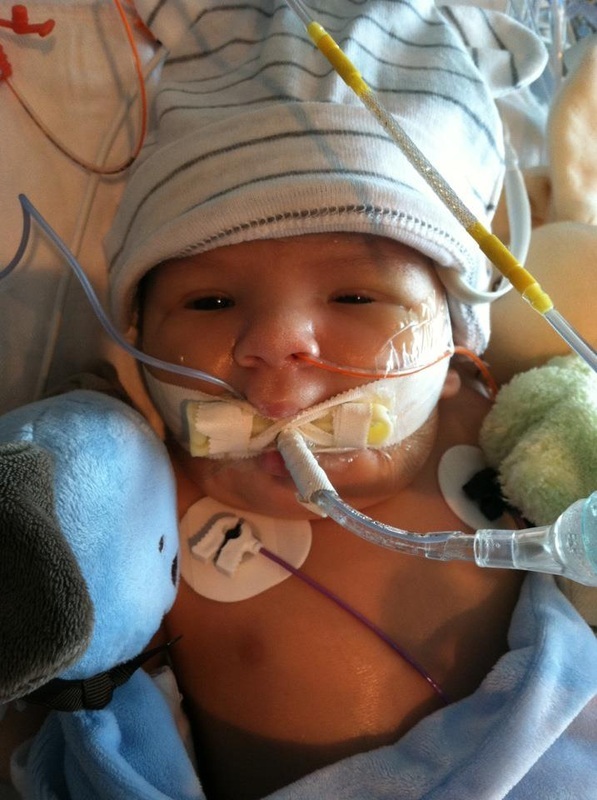 Please remember Asher James & keep his Mommy & Daddy and his family in your prayers. Asher showed us that the only thing that is truly important in this life is love and that we must face each day with courage. We must forgive easily, hope often, and just love. We must not let the pain of his passing overshadow the beautiful gift he was in our lives. He is & always will be our sunshine & the stars will always shine for Asher James. When Auntie visited Asher she would sing this song to him. On her way to visit on 10/22 she was losing her voice, so she quickly recorded "Asher's song" to play it for him later. Please CLICK HERE to read Asher's obituary..
Today we said goodbye to our beautiful Asher James. The room & building were filled with people & people all over the country joined us in a physical & virtual balloon release for Asher. The amount of people that helped us celebrate Asher's life is a testimony to how special this baby's life is and how many people have been changed by his story. 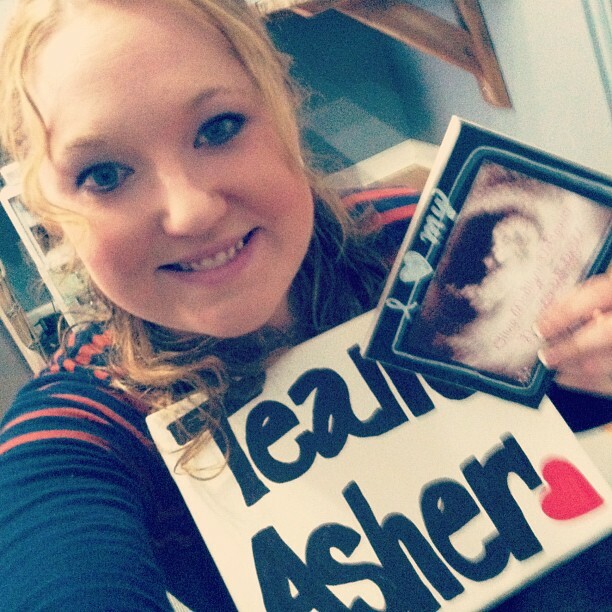 Asher's mommy is determined to continue Asher's legacy. Asher died from thrombosis (blood clots) & there is no cure, no money for research, and no direct training/protocols/correctly sized surgical tools for procedures etc. to help doctors when faced with this issue in infants & babies. As we move forward, we hope to research this area and figure out what we can do to help. If you'd like to stay up to date on what we're doing, please join the TEAM ASHER page on facebook. Thank you all for your continued support & prayers as we try to keep going to honor my nephew's special life. Every moment of Asher’s life was a gift and losing him leaves a hole in our hearts that can’t be filled. The days are heavy and unbearable. But I would do it all over again because I wouldn’t trade a moment of Asher’s precious life. I am lucky to have known this baby & I am lucky to have loved this baby. Asher was, is, and always will be a reminder of the most pure, selfless love; the love and dedication of his parents; the love and unwavering faith of his family and of all the friends who have heard his story & shared this journey with us. Asher showed us that the only thing that is truly important in this life is love and that we must face each day with courage. We must forgive easily, hope often, and just love. And we must not let the pain of Asher’s passing overshadow the beautiful gift he was in our lives. And in the darkest moments we must remember Asher and remember that he is worth all of this and more. To have been able to know & love him, even for a short time, was worth missing him for a long time. We must do what we asked of Asher—we must hold on. Hold onto each other & fight through obstacles that seem much too large to overcome. One day at a time. One minute at a time. And it isn’t about the end result because the end result for all of us is the same—we will leave this life and we will be with those we’ve spent all this time missing. It’s about how we live now and making sure we are the best people we can be when the time does come to meet those we’ve lost again. I will make the same promise to Asher that I made to his sister—I will take good care of your mommy & daddy and I will work hard to be all the things I promised you I would be while you were here. 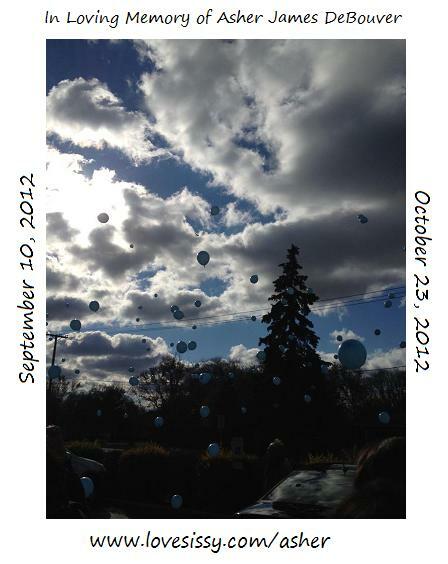 On October 28, 2012 as we were saying good-bye here at home many were doing the same around the world by releasing their own balloons in memory of someone so little yet so inspiring. Rest in Peace our sweet Asher James. 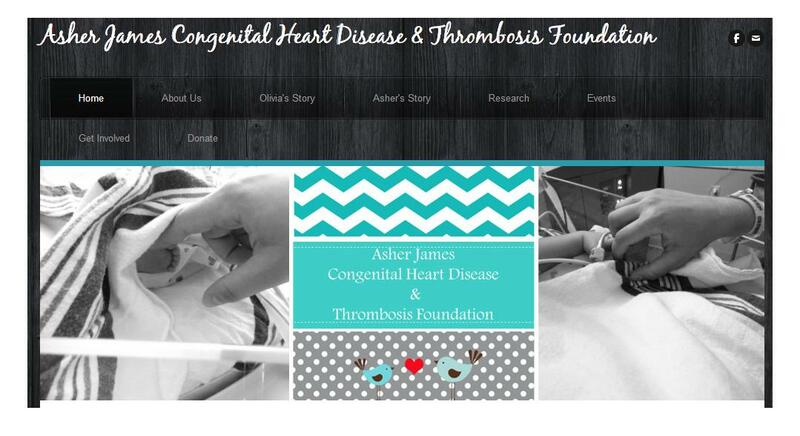 Asher's parents are so proud to announce the formation of The Asher James Congenital Heart Disease & Thrombosis Foundation. The foundation is working with Lurie Children's Hospital Chicago, several doctors from the hospital, along with a network of dedicated organizations & supporters to make a difference in the lives of those affected by thrombosis & CHD--especially infants & children. The foundation needs your support. It will help the foundation grow if you "like" the foundation on facebook. CLICK HERE to visit Jen's "IN MEMORY" page.